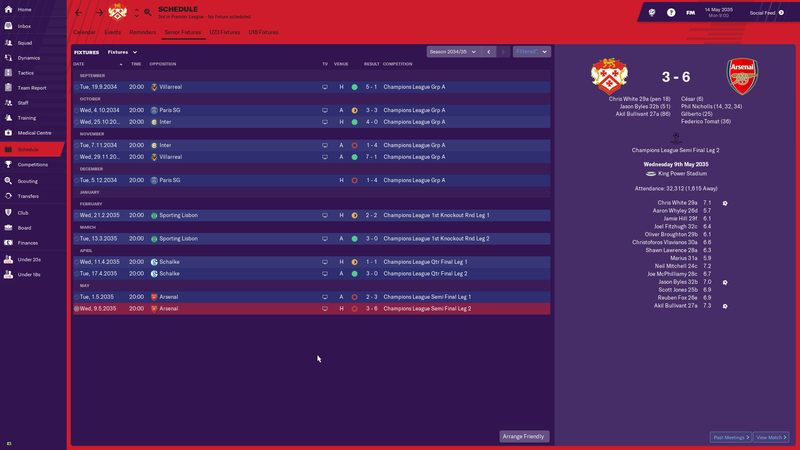 After three consecutive league wins we were looking forward to a proper challenge in the Championship. League Table - we pretty much topped the league for the whole season, but Brighton pushed us all the way. 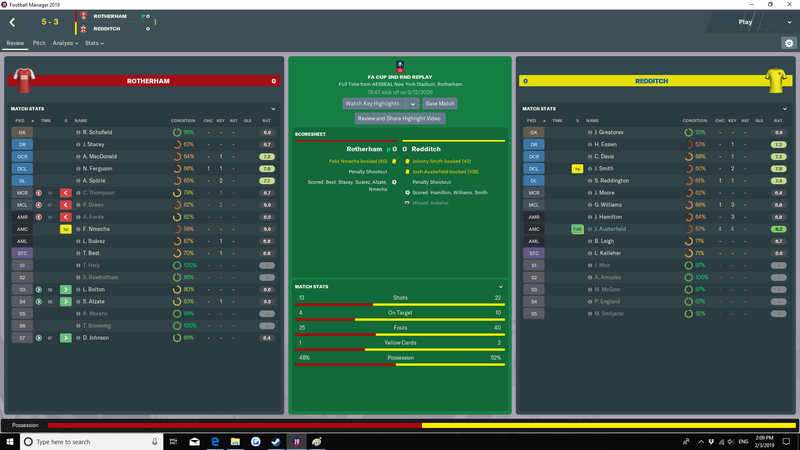 Carabao Cup - we were edged out in an excellent match. 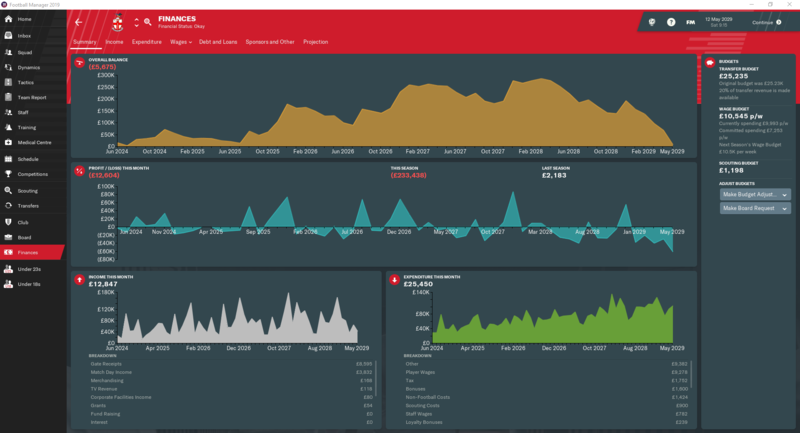 FA Cup - there was no big cup run this year as we lost out to Premier League Newcastle. Squad - the squad has been strengthened throughout the season so there should be enough players here capable of playing in the top flight. 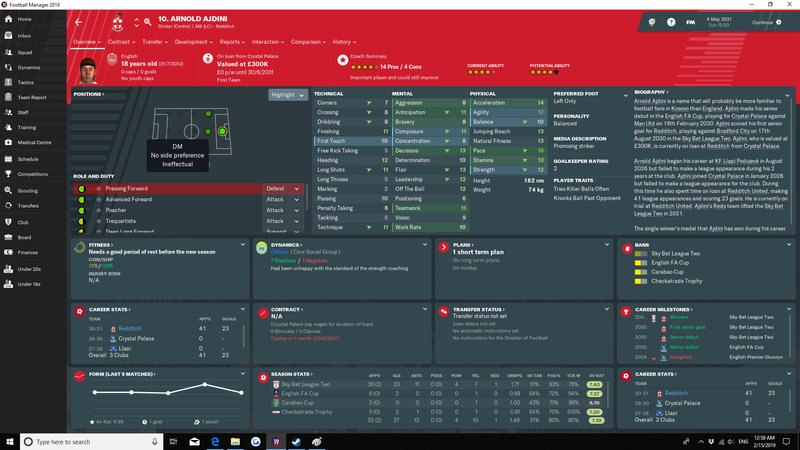 Transfers - my one and only cash signing turned out to be just a backup player. 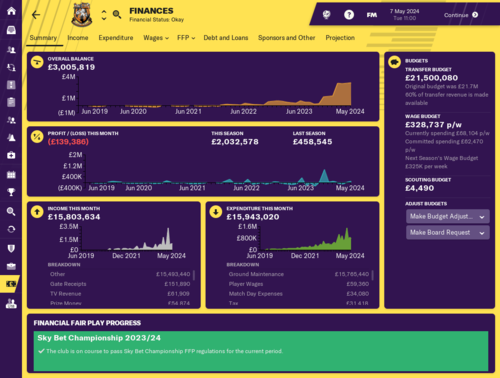 Finances - we've been leaking cash, but making it to the Premier League will take care of that. Neil Edwards - this goalscorer made a huge difference. Sebastian Kovacs - I was lucky to find this replacement for Swift. Adam Kavanagh - he kept his place despite the new signings. 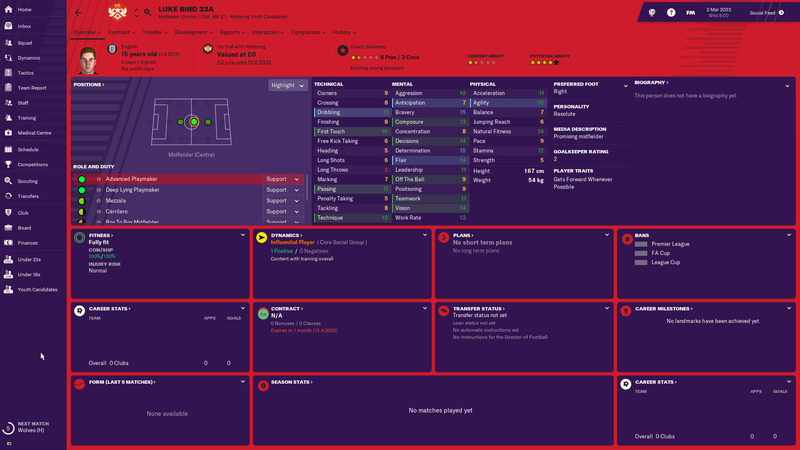 Markos Fosteris - this new signing is our most valuable player. 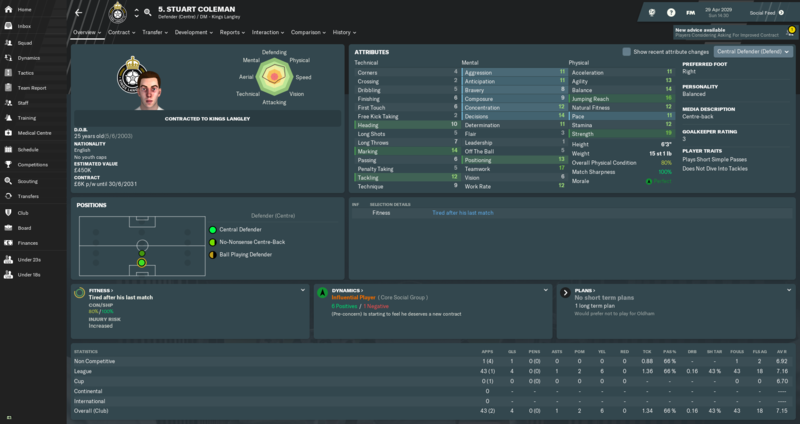 Stuart Coleman - one half of a solid defensive partnership. Four consecutive titles was just unthinkable, surely next season I'll get the relegation battle I've been waiting for? 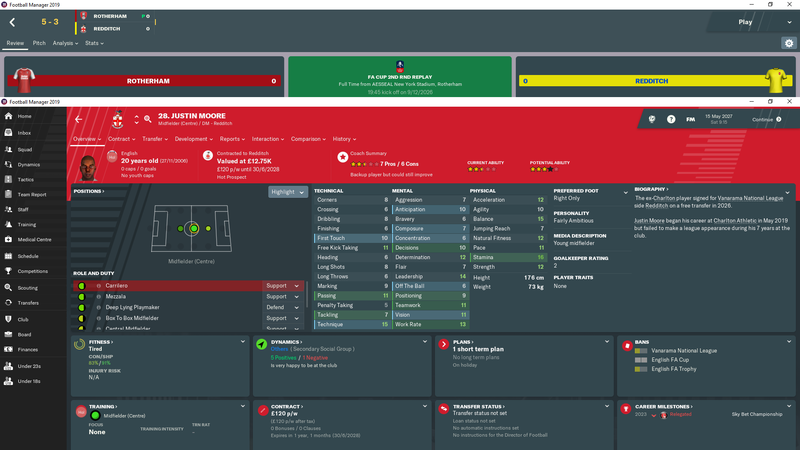 Notably Burton Albion became our senior affiliate allowing us to bring Marcus Dinanga (https://imgur.com/gallery/kDLEuHr) in on loan who rattled in 26 goals in 42 apps. Next Season Aims - Strengthen the squad and make a push for the playoffs. I'm currently doing a challenge very similarly to this. Start unemployed. Take over Lower league club (tier 6 and below), and try to win each league 3 times before taking a job at a club in the next higher tier. It's grueling, it's fun, it's a fantastic mix of short-term and long-term gameplay and it makes for some very interesting decision making. Might do a proper write up if i get the time. Wow good luck! 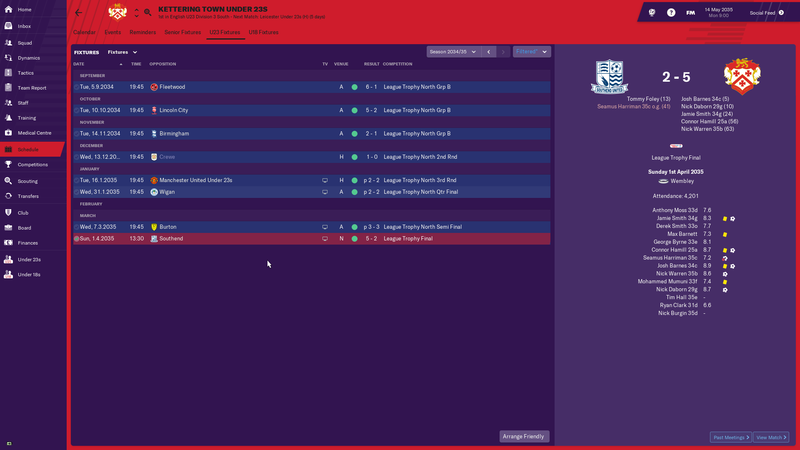 I've just started my Lancaster City save in the Northern Premier League and have a media prediction of 20th and board expectation to Bravely Fight Relegation. 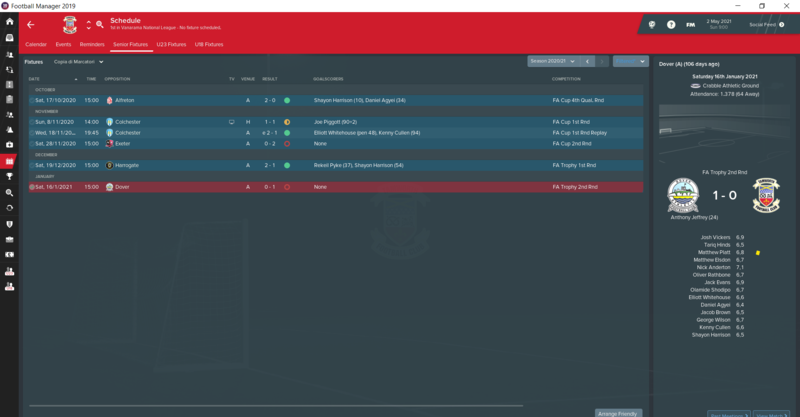 Next Seasons Aim - Promotion or playoffs again at least. Im going to do this. Ive been saving and reloading for hours to try and get one of the lower reputation teams. I have a redditch save and if I don't have one by tonight I will probably just start with them. 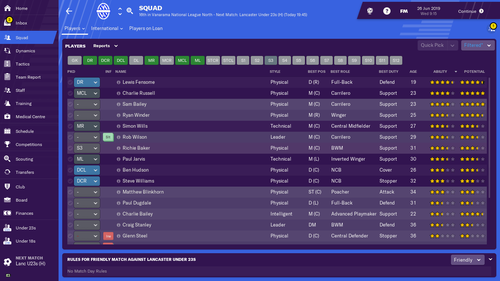 Going with Lancaster City as well after a failed try with Mickleover and far too many restarts to get Lancaster. The team has midfielders...and that's about it. 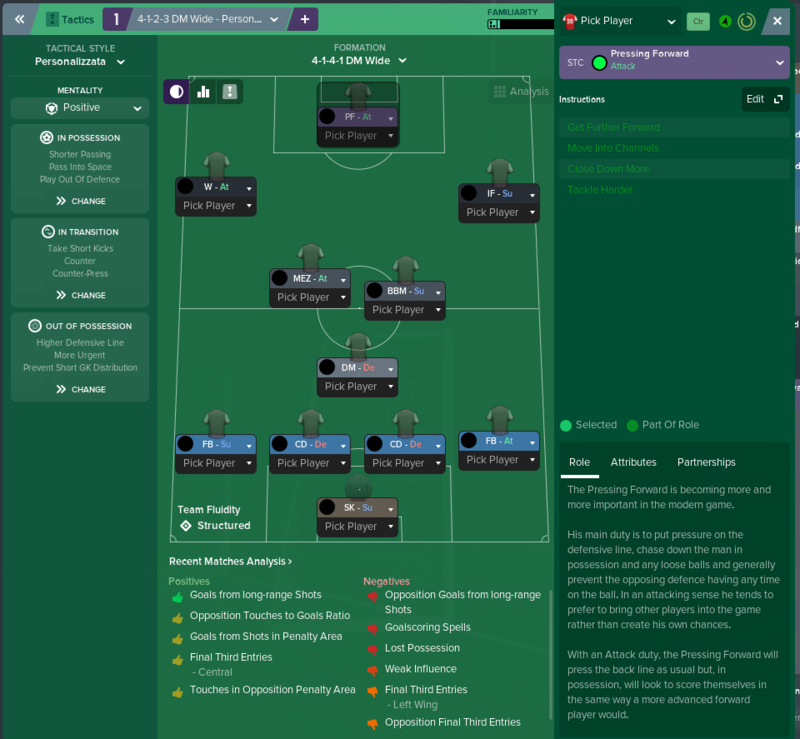 Aiming for some hoofball again, got the offensive side of it down decently with Mickleover, going to try a 5-1-2-2 to tighten up the defense. 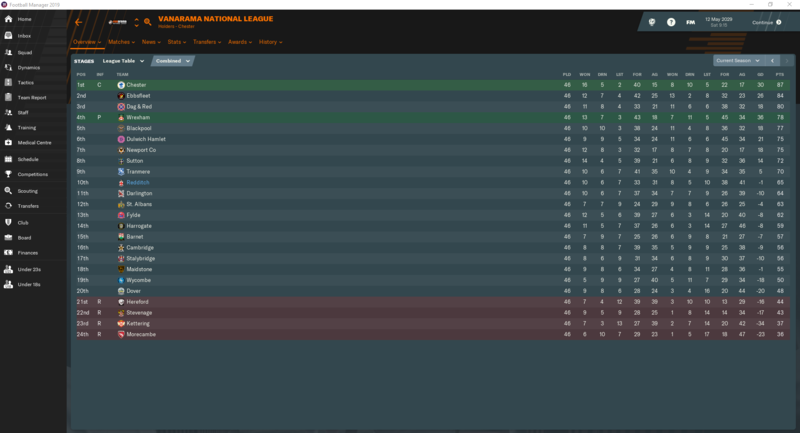 League Table - my third season in the VNL after finishing 10th and 13th respectively. Our reputation had improved by half a star compared to last season which allowed me to have a busy summer bringing in some ex premier league youngsters to the squad. 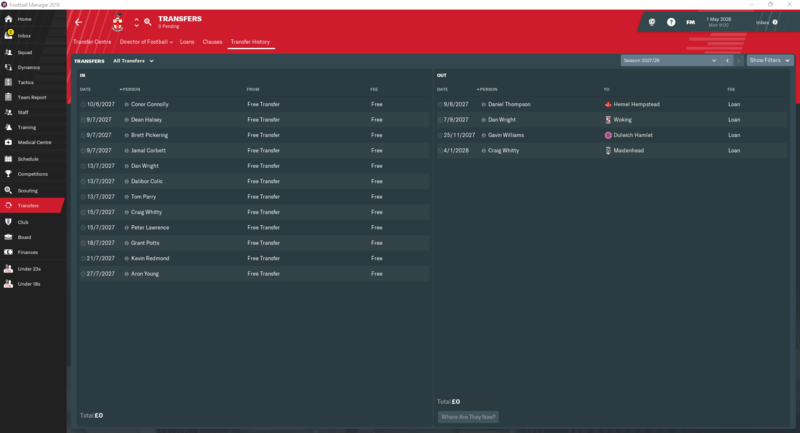 Had noticed after a few signings, the promises requested by players had changed from wanting a mid table finish to wanting to gain promotion but had thought nothing of it. 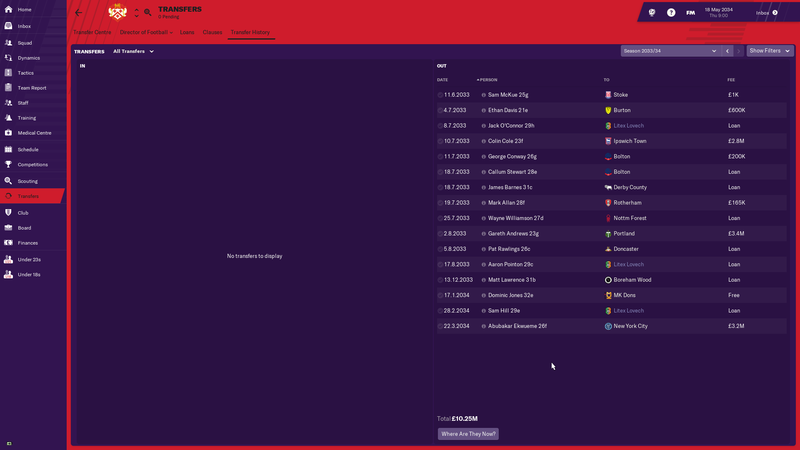 Scheduled some tough friendly games hoping to generate some funds (did not work by the way, I don’t know how the rest of you do this but it certainly has not worked for me). Games in place against premier league outfit Leicester (finished 12th), York who finished mid table in L2 and also Rangers and Hearts. Let’s just say that promotion was the expectation after our friendly games. Started the season against predicted (and eventual) champions and dominated the game only to be undone late on for a 2 – 2 draw at home. I drew my next game and then won my next 4 on the trot to find myself second. Stayed in the play off zone from then on until a dip in the season in Oct/Nov which saw me drop into 9th. Had a bit of a break from the game (xmas/new year) and came back with a vengeance winning back to back 3 – 0 games. Was pretty consistent from December onwards being able to match the top teams but then somehow lose against the lower ranked teams which was frustrating as it never let me quite challenge Billercay and debt ridden Crewe up the top. 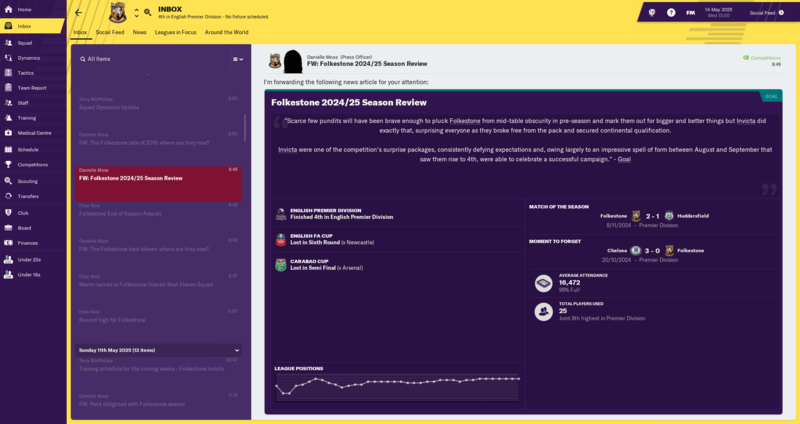 Finished the season in 5th but was quite confident going into the play offs as I had favourable results against my competition and had no real injury issues. Come to think of it, I didn’t really have many injury troubles throughout the year and if I did, I had a number of available replacements (squad number is way too large!). 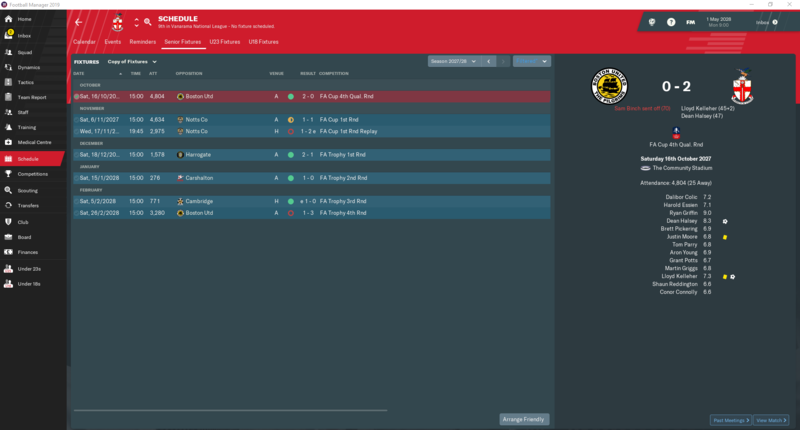 Into the playoffs first up was Morecambe at home who I won 2 – 1 in the league and drew 1 – 1 away. 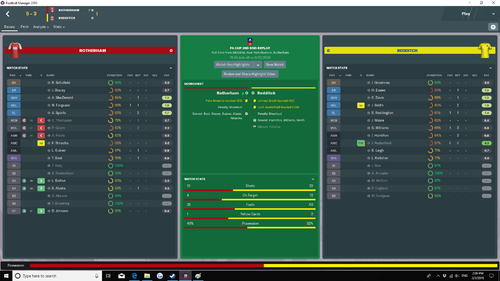 Was a game I dominated possession 60% but we had both created a number of chances but I had 2 ccc’s against their none for a 2 – 0 win with goals coming in the 82nd and 90+2 minutes. Next was Chester who had finished 3rd, with 6 points more than us. They had only lost once at home all season and I knew this was going to be a tough challenge. In the league we drew to them at home 2 –2, a game which we dominated but conceded a late penalty to former Villain Jordan Bowery in the 90th minute (common theme to the season). Our league game at their home ground was in Feb which I remember vividly (for the wrong reasons). We took an early 2 goal lead in the 19th minute for it to only last a minute. 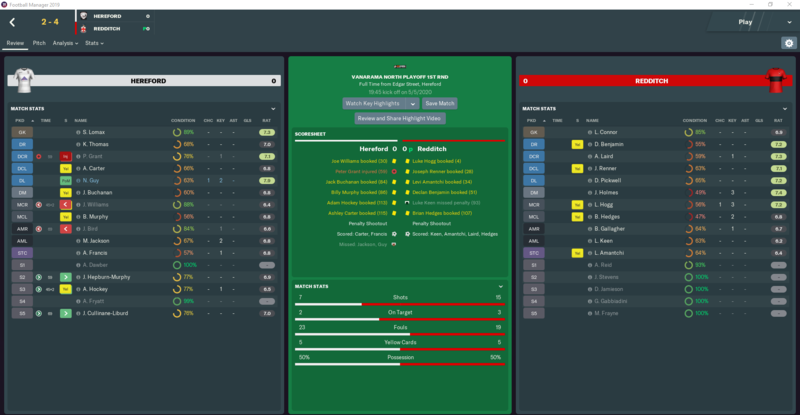 We held on at 2 – 1 until the 66th minute until a 90+2 minute goal gave them a 3 – 2 win. We had 2 ccc’s to their none so yeah not sure how they scored 3 against us. Anyways, the game was a close contest with both teams creating a lot of chances. We took the lead in the 52nd minute before they equalized in the 78th. We were playing more of a possession game with 60% going our way but could not get the decisive goal before the 90 minutes were up. Two minutes into extra time and we scored to go 2 – 1 ahead and that’s how it remained despite a nervy end. So off to Wembley it was against a debt ridden Crewe. Crewe blew their chance of winning the title on goal difference on the last day after losing and Billericay getting a point to end up equal points on 100. 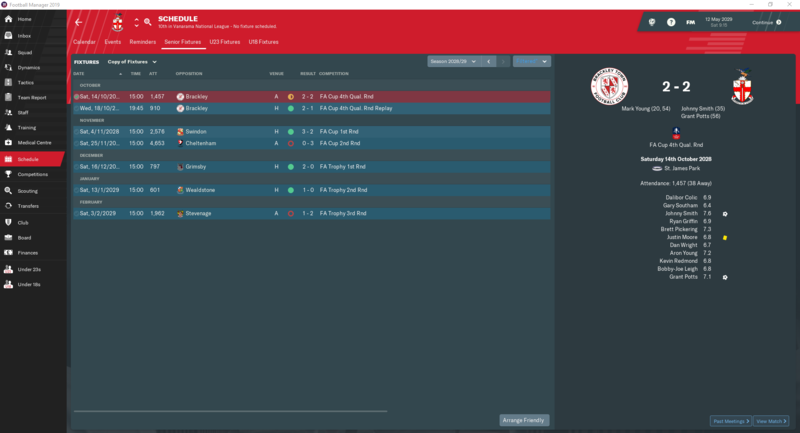 In the league I had beaten them 2 – 1 away from home and draw 1 – 1 at home. 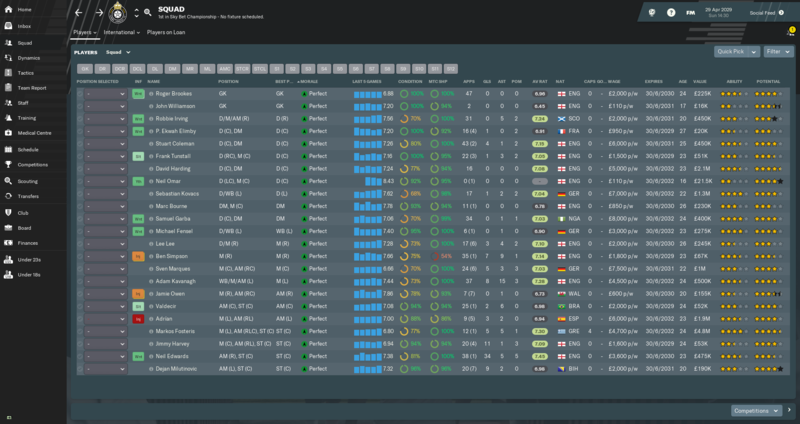 I really don’t know what happened but for some reason they had a number of debutants from their u23’s in the starting line up. Most of the players they had used throughout the season, including starting gk, 27 goal Att and their other best players were not even in the squad. Did they throw away promotion? Just had a look and they played their u23’s in the semi final as well. Anyways, Kevin Nolan’s irrational decision is Stalybridge’s gain as we run out comfortable winners! 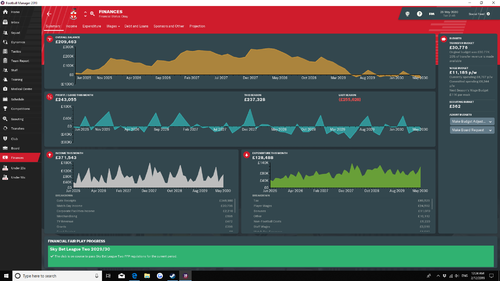 The poor trend continued in the cups, being knocked out in the FA cup 4th qualifying round by Spennymoor who were relegated from the league below us and also knocked out by Macclesfield in the FA trophy who were also in the league below us. After four years of being in debt and constantly relying on cash injections, we sold a couple of players this year for decent money. 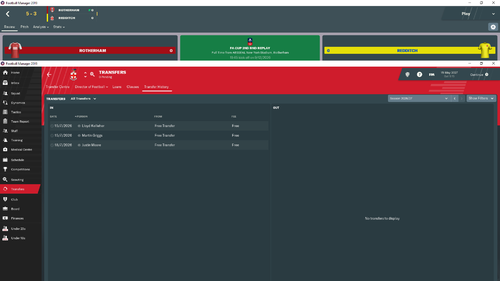 Managed to bring in 320k and also arrange for loan back for both players who were both pivotal to the team. This put us back in the black where I managed to finally go and get some coaching badges, got my Continental C and now studying for B. The playoff final windfall also helped the bank and the board have accepted to improve the youth facilities and we’re also going professional ahead of L2 next season. Forgot to take a screenshot of the stadium upgrade but we are expanding by 800 seats for $100k which seems like a lot less expensive then others. 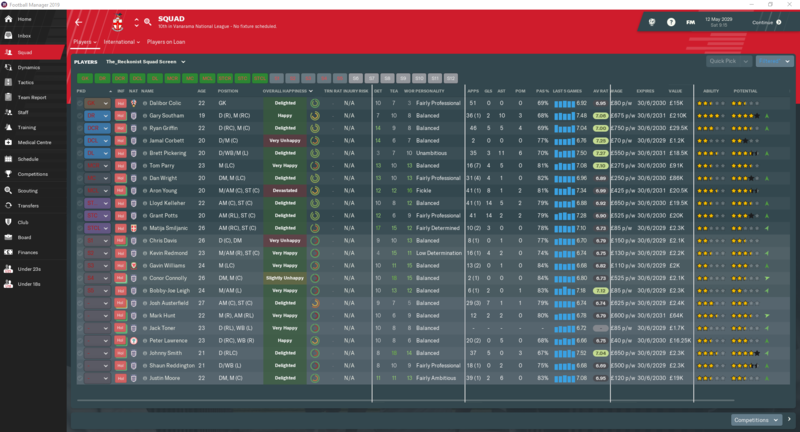 Started the season very strongly and was involved in the title race for most of the season until falling away in march. A good run in the last few games took the club to 3rd. 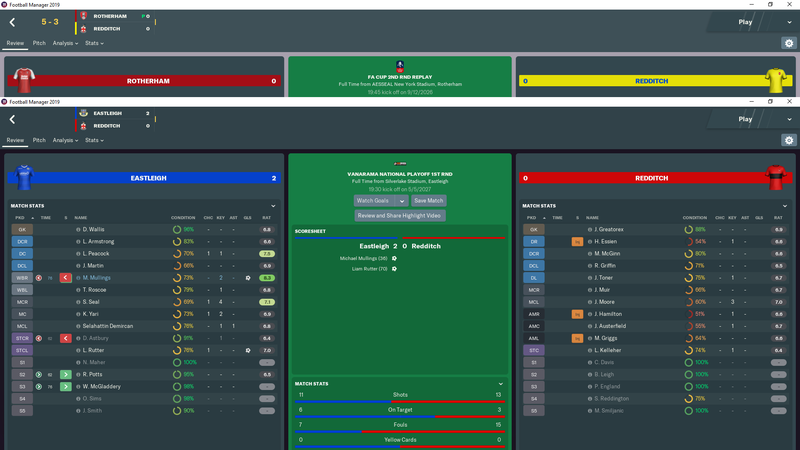 In the playoffs the club got past Oxford Utd on penalties before easily seeing off Aldershot in the playoff final. In the cups there was limited progress. 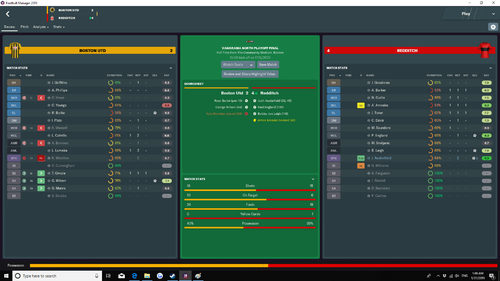 In the FA cup 2nd Rd the team were away to L1 Coventry and went 2-1 up in the 91st min despite being 2nd best all game before conceding a 94th min equalizer. 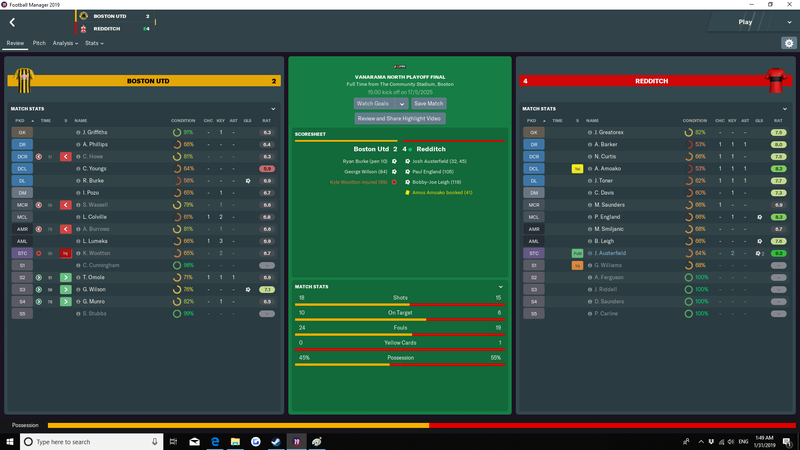 Lost the replay 1-0 in another 1 sided effort. 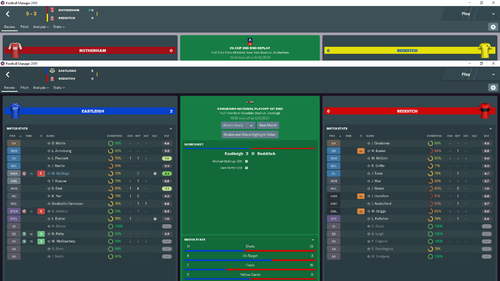 In the FA Trophy i was pretty annoyed to lose 0-4 at home to struggling VNL Oxford City even though i had a player sent off after 35 secs. 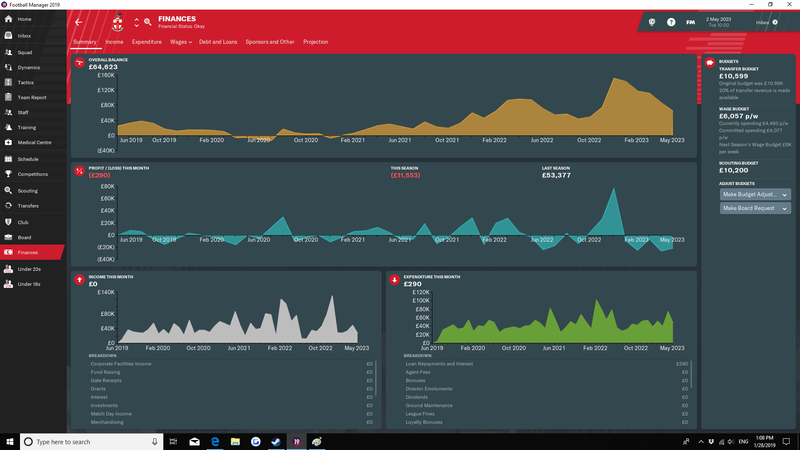 Finances looked very steady for most of the season as average attendance went up from 1700 to 2300. 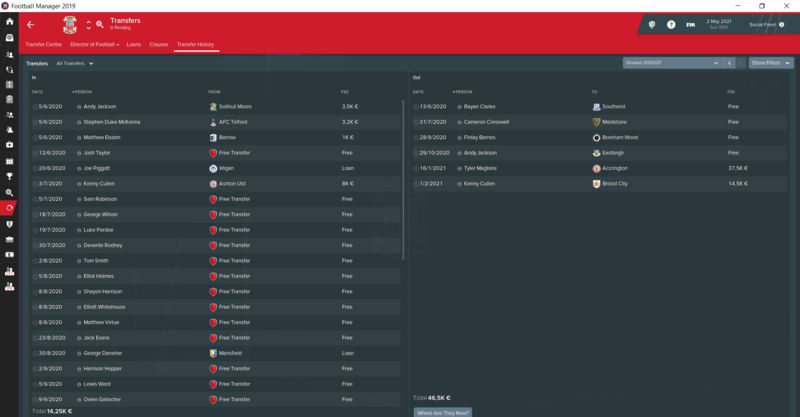 I had sold 2 good young players in Aug as the finances had been looking less solid. In Jan i sold the 50% sell from for Vernon for 3 million. 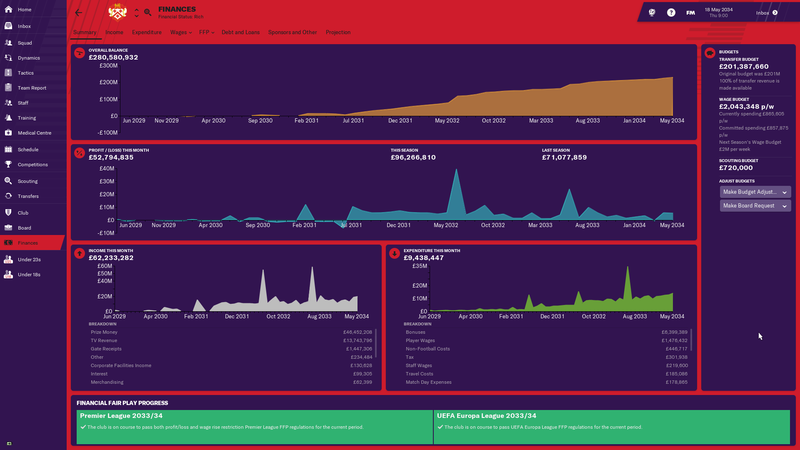 In march the club was taken over and teh new owner put in another 375K. As a result of the improved finances the club agreed to improve the training and youth facilities and improve youth recruitment. 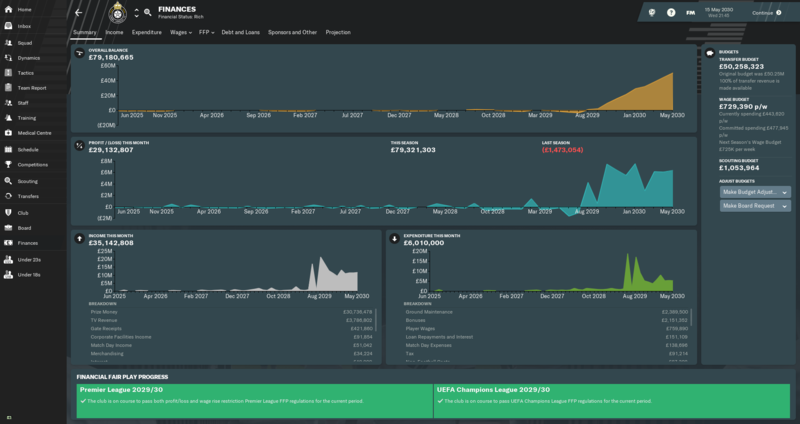 Oddly they took out a loan to increase the stadium capacity. In terms of the squad most of the players were pretty solid with Klass and Payne again excellent in central midfield. 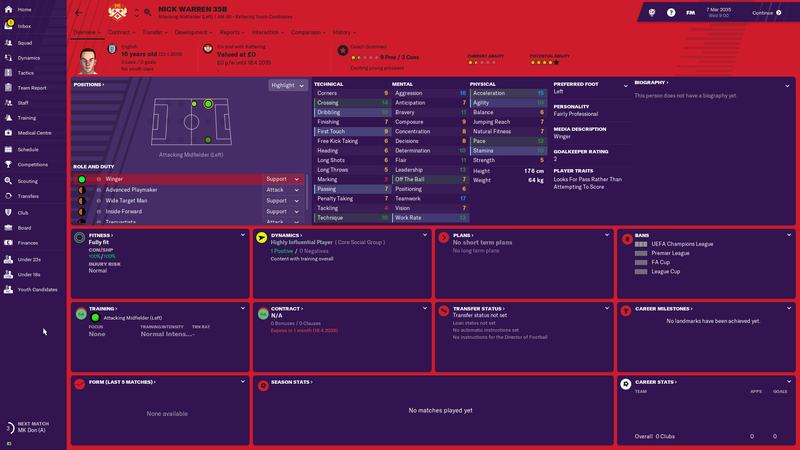 George ended the season as top scorer although my other strikers didn't really contribute a lot, it was lucky my midfield chipped in with a few. Rufati showed great improvement this year. The media prediction for my first season was 22nd, So I knew this season would be tough one. So i was looking to pick few decent players to help with the lack of depth we had. 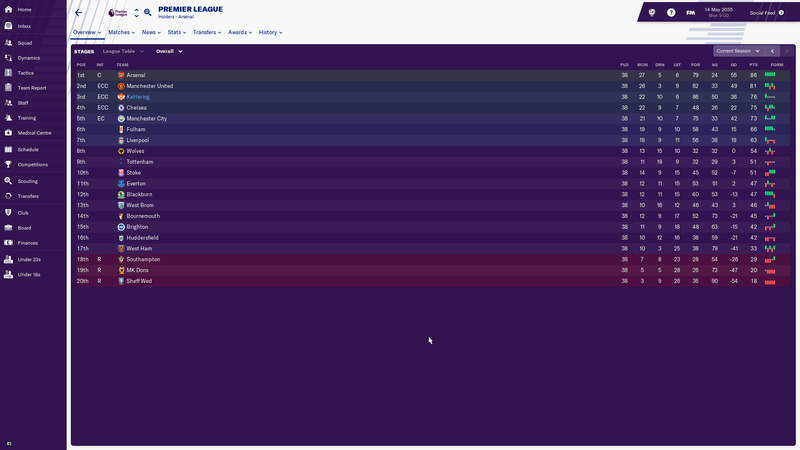 League Table- An 15th place finish to the season was a solid season to me we were nearly dragged into the relegation battle in mid season with our form dropping but in January our reinforcements helped us pick up some wins and we pulled away from relegation zone. FA TROPHY- We had a few good wins, but couldn't quite complete with Tranmere Rovers in the third round we were beat 3-2. 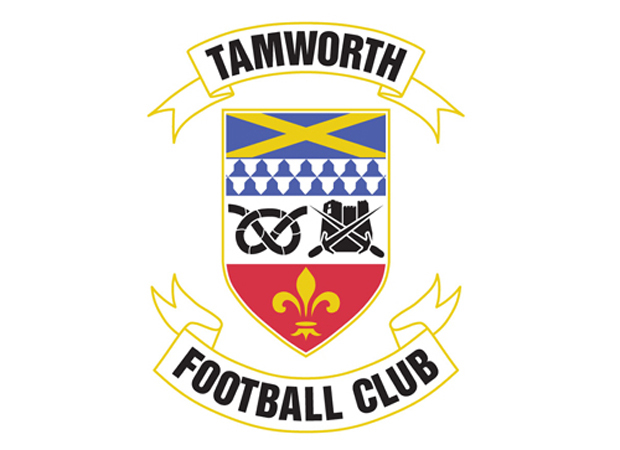 FA CUP- I was bit shocked at this result because i thought that we should of beat Bamber Bridge but they were the better of the two teams. 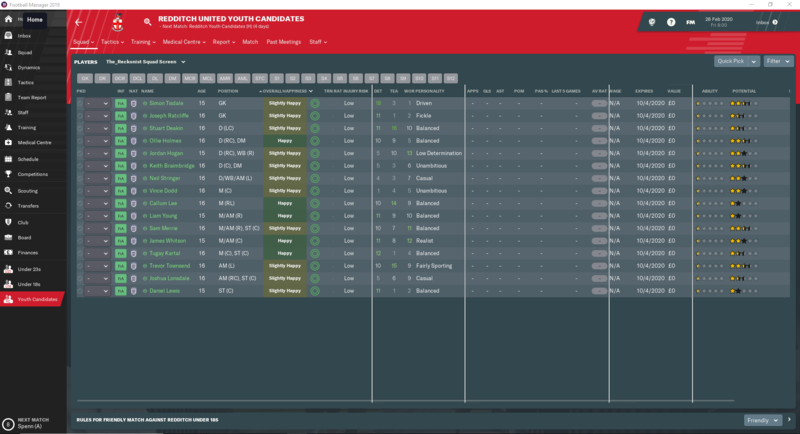 Squad- I think by adding two or three more players we could have a decent squad for next season. Transfer History -Free transfers to give me bit more depth. Finances - I was try to stay in my means of wages but went over slightly but hopefully will be getting rid some deadwood try bring back up. Highest average rating -Aaron O'Connor. Most valuable player -Ben Milnes. 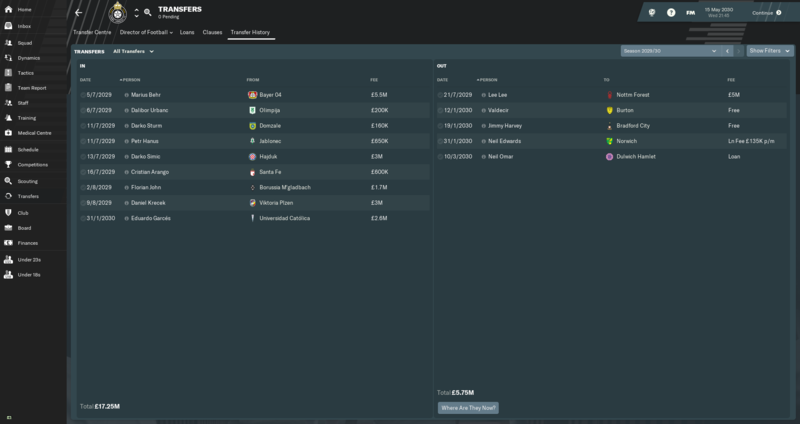 As long as we get the right signings I think we manage to avoid Relegation hopefully. Good luck! 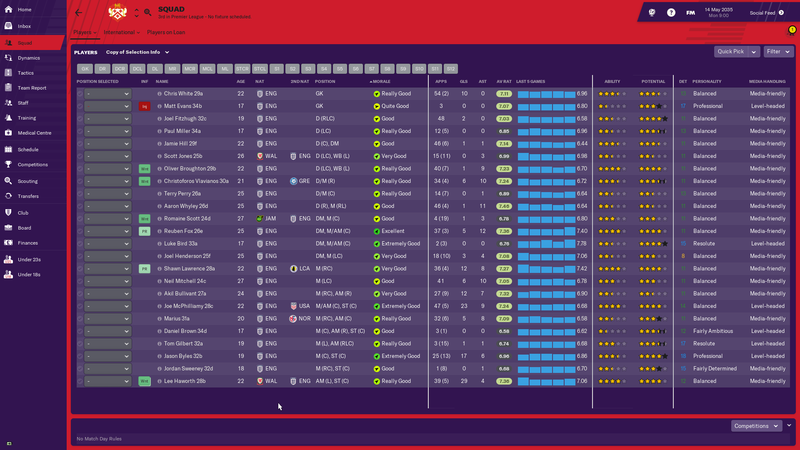 Made a plethora of signings to try and get some ability in the side, most of the better players are ageing! I have the 25th save for Lancaster; apologies I didnt mention! Next Seasons Aim - To get back into the playoffs. 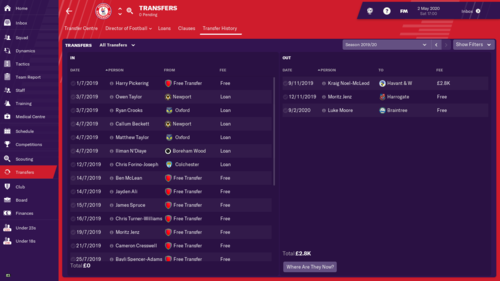 Pretty awesome season, this time we actually paid for a couple of players and i was more reliant on loan signings than i have been in the past, mostly due to some serious long-term injuries. I really thought that the championship was where it was going to bite, but despite still having plenty of league 1 level players we were able to achieve promotion as champions. 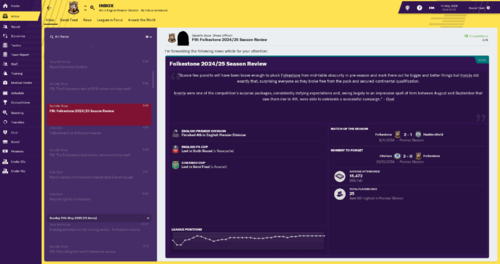 This was particularly impressive given we had something like a 60k wage budget which was half of the next ranked team and a fraction of what most of the teams in the league had, many of whom had players who earned in a week nearly as much as my whole team. We had a couple of good cup runs as well which i was cursing by christmas when my players started dropping like flies but finances are looking good. Anyway, we did respectably well and despite a springtime wobble we held on to win the league and smash a load of records. Best thing, we held on until we were in the prem before planning our new stadium. Just need to stay up next season! I have started as Redditch. Wish me luck guys. Next Seasons Aim - Back to back irritating seasons are making the playoff push become a more serious aim. League Table - All in all a great season. Knocked out of the FA cup early in the 3QR by Halifax and in the FA trophy 3rd round by Fylde. Star performers this year were Amantchi and Keen. Laird and Renner were also solid at the back. 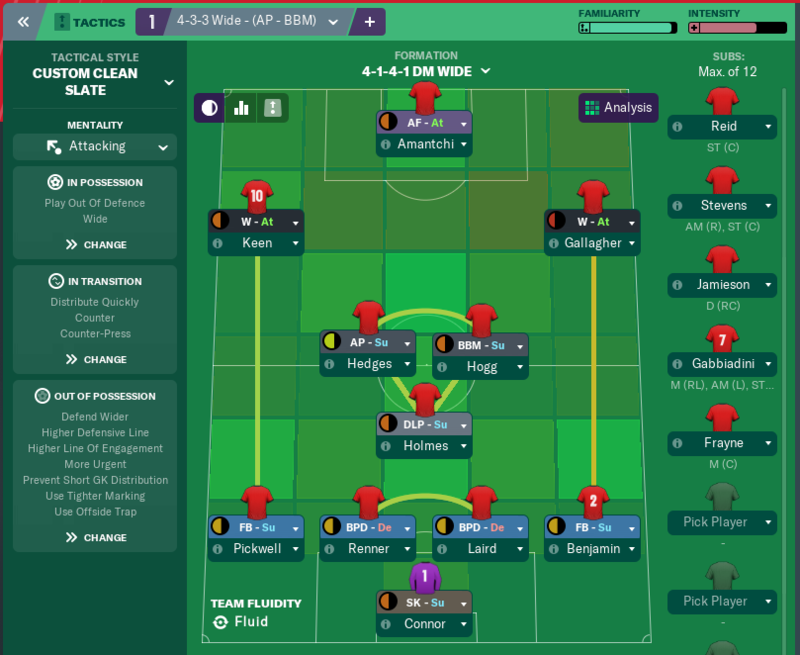 Tactics - Nothing crazy here , just a solid structure. In game I tend to make some minor adjustments where required such as changing FB to WB or AP from Support to Attack duties. 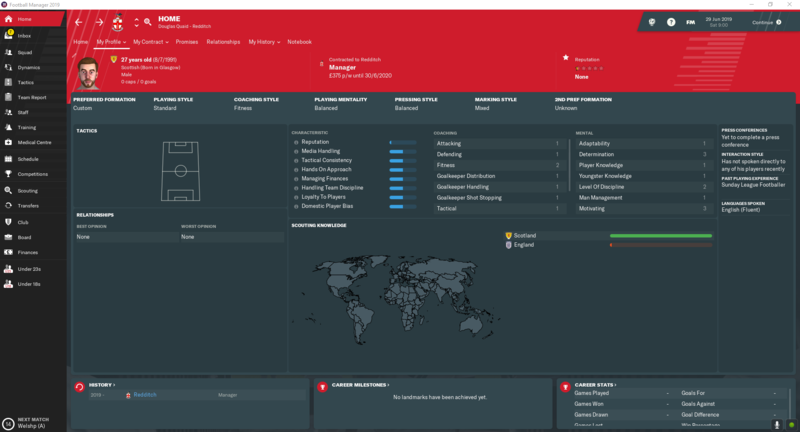 I will most likely stick with this for a while as its tried and tested for me in FM19 so far especially at lower league level. 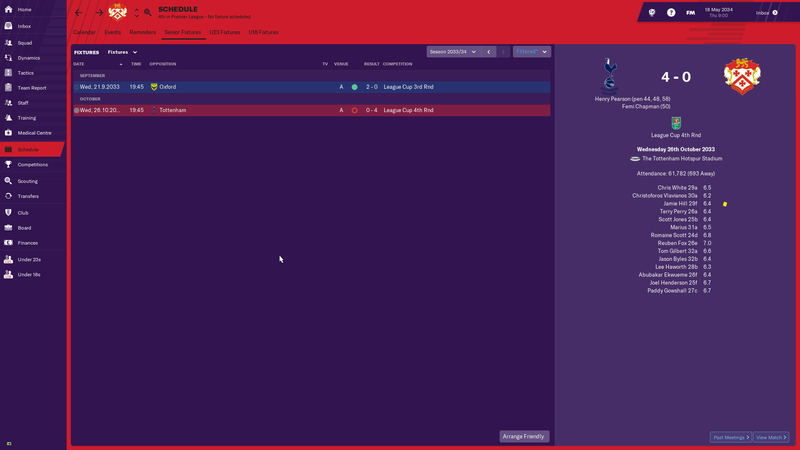 got sacked on my kettering save so going to re load challenge again hopefully get my home town team. Signing of the season, Hopefully i can nab him again next year. 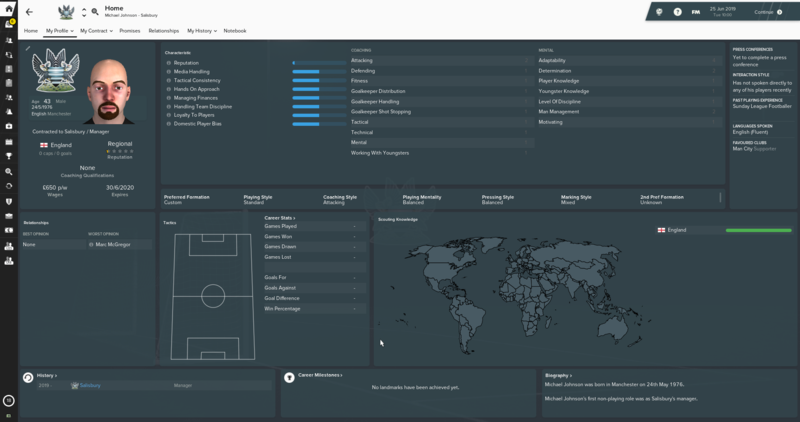 Basford Utd - Manager page. Starting this tonight. Hopefully crack on through the week. "All of Scarborough's dreams came true this season as they defied expectation suggesting they would be relegation certainties and instead mounted an almost-unbelievable promotion winning campaign. It was a season of unlikely yet jubilant success for The Seadogs, who consistently defied the odds from the outset, and eventually clinched promotion." We have finally done it, and to be honest it never looked in doubt; if anything, I'm ever so slightly disappointed we didn't win the title. We finished in 2nd place on 82 points, 4 points behind Guiseley. 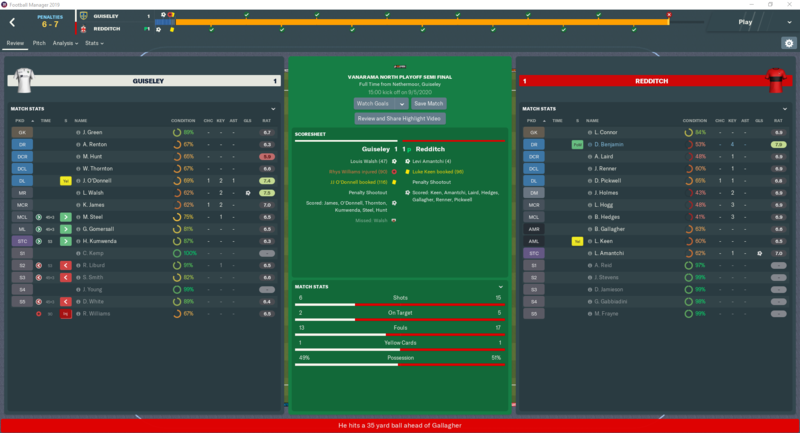 Looking back, there are 3 results that, had they gone our way, we would have been champions; a 1-0 defeat at home early in the season to Blyth who absolutely robbed us (we had more shots on target than they had shots! ), a 0-0 home draw with Guiseley just before Christmas, and a very disappointing 0-0 draw at home to Brackely who were hovering just above the relegation zone in mid January. There are a few more results, but those 3 are the most significant for me. We did get our revenge on Blyth in the playoffs, winning 2-0 at home, before sealing promotion with a very comfortable 1-0 win at home to Chorley (at this moment I would like to spare a thought for poor Chorley; they were comfortable leading the table going into the last 5 matches but ended up drawing 2 and losing 3, including defeats to ourselves and Guiseley, to eventually finish 3rd). We had much better luck in the cup competitions this season. 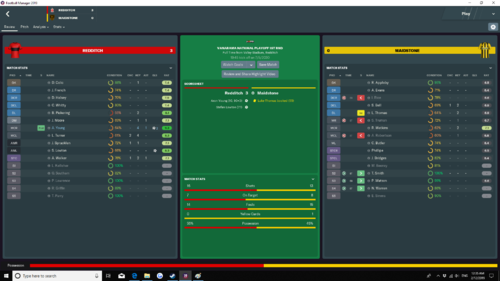 In the FA Cup, we made it to the 4th Qualifying Round, winning 4-0 and 5-0 at home to Dereham and Nuneaton respectively, and we took Macclesfield Town from the National League to a reply after a 2-2 draw at Moss Rose, where we can consider ourselves unlucky to lose 1-0 at home in a match we edged. We actually dominated the first match, but unfortunately, we were left to rue wastefulness in front of goal. As for the FA Trophy, we made it to the 2nd Round. We beat Harrogate 2-1 away from home in the 3rd Qualifying Round, which was followed up by a 4-0 win over Felixstowe at home. 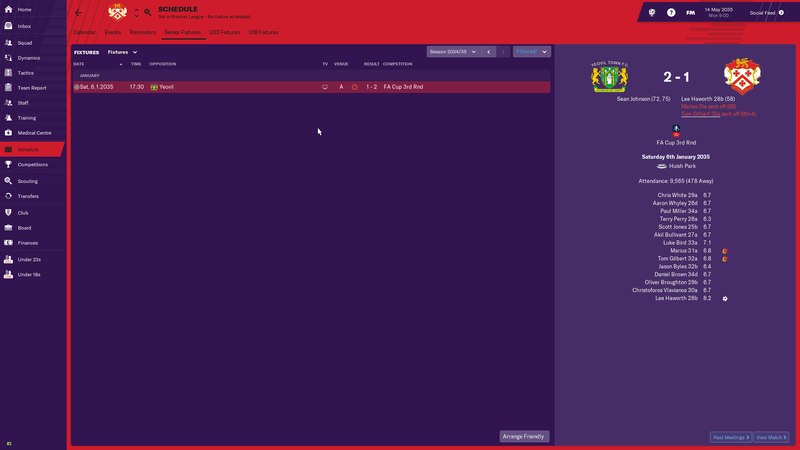 We then lost 1-0 away to National League Crawley, and we were probably lucky not to lose by 3 or 4, to be honest. One of the key factors to promotion this season was the feel good factor among the players. 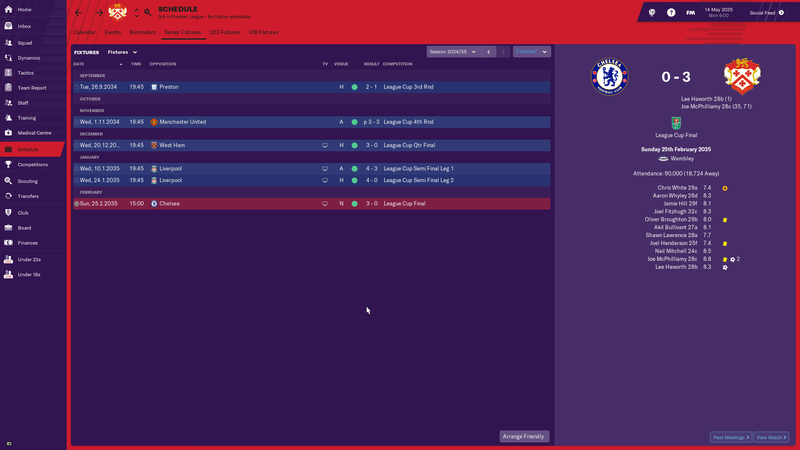 Morale was constantly high and, unlike last season, I had very little issues with player unhappiness this season. I rotated the squad a little bit more this season, meaning the vast majority of players were pleased with the amount of minutes they were receiving. 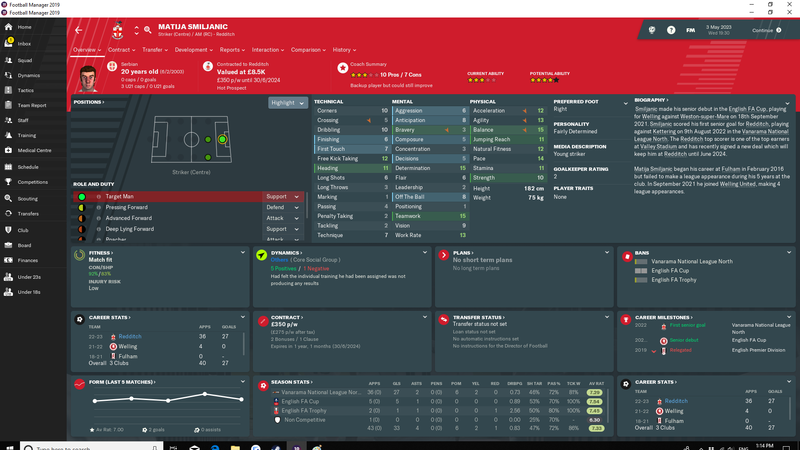 Sam Muggleton: Our best player this season, and quickly becoming one of my all time best buys in FM. 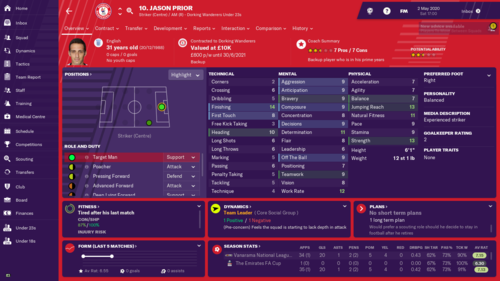 Since he singed for us back in 2020, he has made 167 league appearances, scoring 9 goals, making 30 assists, and received 15 Player of the Match awards. He has never had an average rating below 7.02, and this season was his best yet in terms of overall average rating; 7.36, while also contributing with 4 goals and 8 assists. 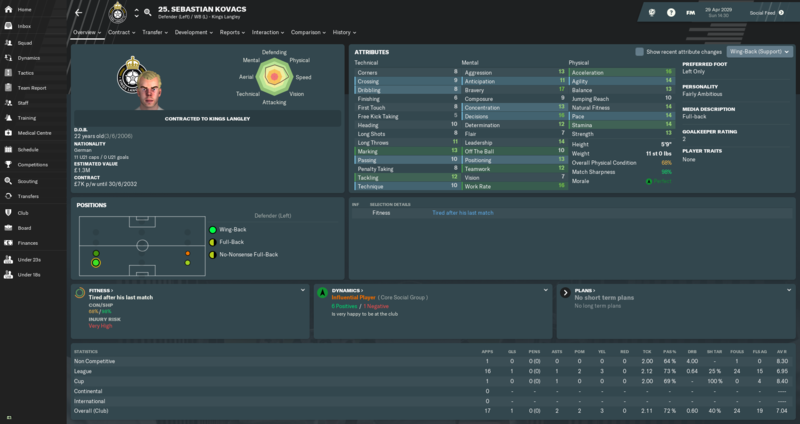 Despite him only be rated as a leading player for most Regional Premier Division sides, I believe he still has a part to play next season. He deserves it, after all. 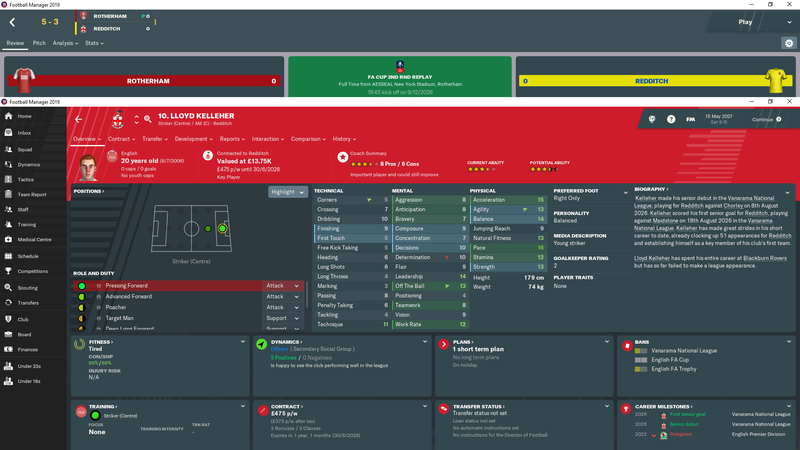 Diego Lattie: A young and powerful full back who will be more than good enough for next season; Lattie made 40 league appearances, scoring 2 goals and getting 5 PotM awards, with an overall average rating of 7.18. I'm looking forward to seeing how he develops over the next few seasons. Matty Dixon: An absolute revelation in the role of a Box to Box Midfielder. An overall average rating of 7.13 and 9 goals in 40 league appearances is a career best for him, which is all the more amazing when you consider he has a finishing of 4 and long shots of 7. 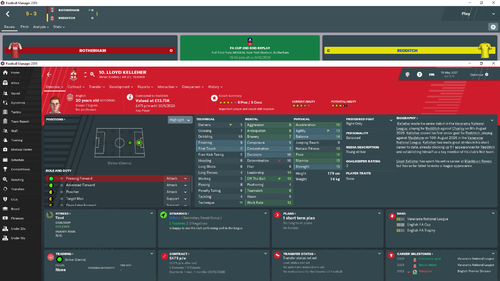 Like Muggleton, he's only rated as a leading player for most Regional Premier Division sides but will still be around the squad next season, most likely as a back up player. Jean Palmer-Leandre: An excellent player for this division. Signed on a free transfer after his release from Man City, he was by far our best player. 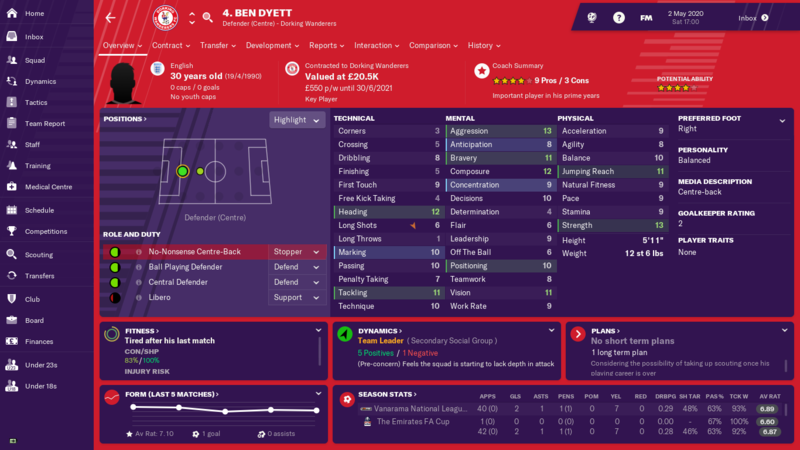 Despite being slightly underwhelming on the goalscoring side with 3 goals and 4 assists in 41 league appearances, general all-round excellent performances saw him finish as our 4th best rated player with an average overall rating of 7.11. 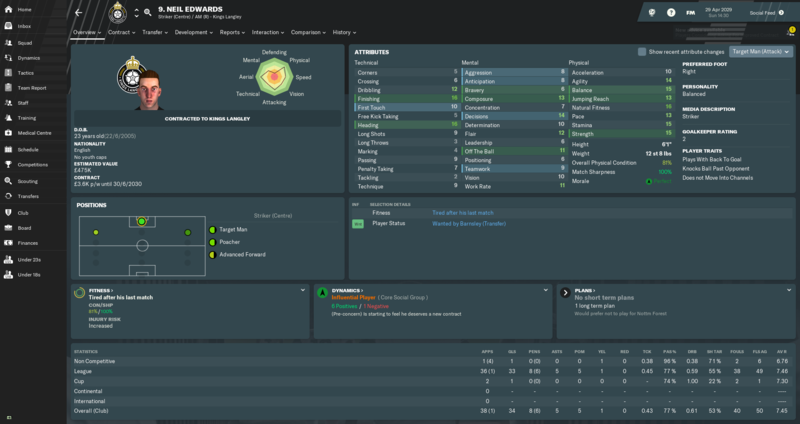 Shamrock Rovers were interested in signing him on a pre-contract deal, but I've offered him new terms which I'm expecting him to sign. He'll more than likely be the key midfielder next season, and possibly for however long we remain in this part of the league system. Ronaldo Brown: Back in the side after a change in formation, Brown was a key player for us this season, with 5 goals and 11 assists in 37 league appearances. 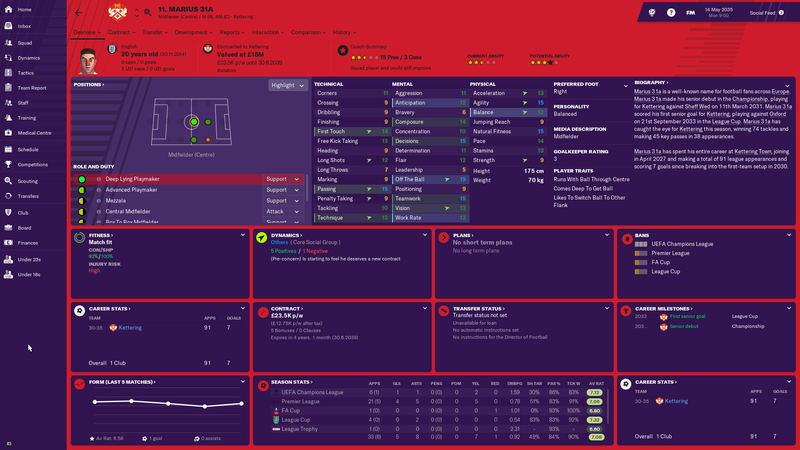 Despite finish with an average rating of 6.95 in the league, outstanding cup performances saw him sneak in the top 5* with an average overall rating of 7.07. 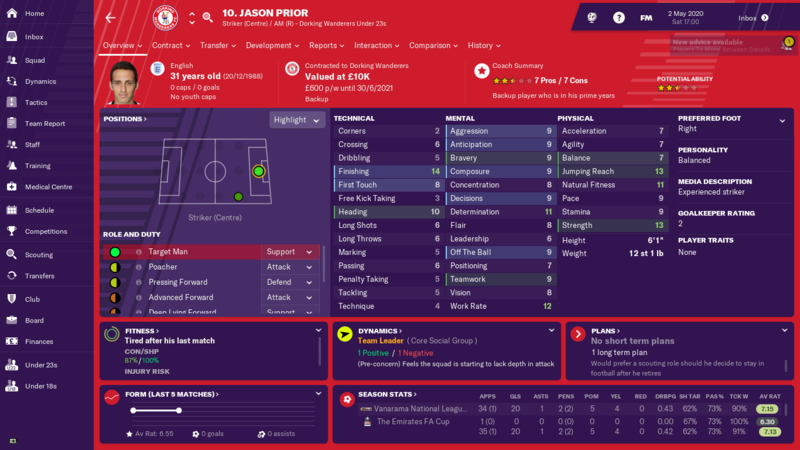 He'll probably be a back up option next season, but he is still a quality player, and will be at the club for the forseeable future. 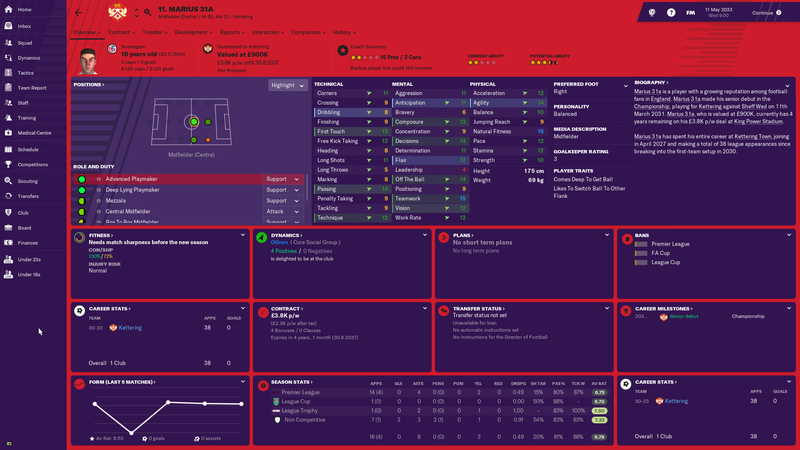 Honourable mentions to George Hughes, Mohammed Sangaré, Ben Adamson and Joe Noble (our first youth player to make a notable impact on the squad), who finished with average overall ratings of 7.10, 7.02, 7.01 and 7.00 respectively. *Hughes actually finished 5th in terms of overall average rating, but because he made just 14 appearances, 6 of them starts, I felt that Brown was a better choice for the 5th place spot due to his greater overall impact. 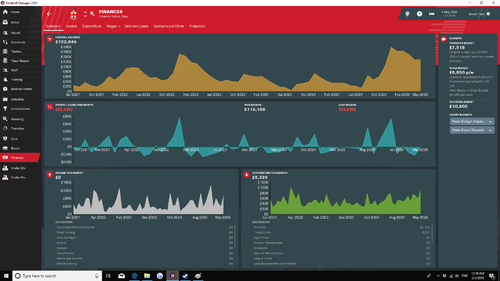 Unfortunately, our finances are looking dire at the moment. 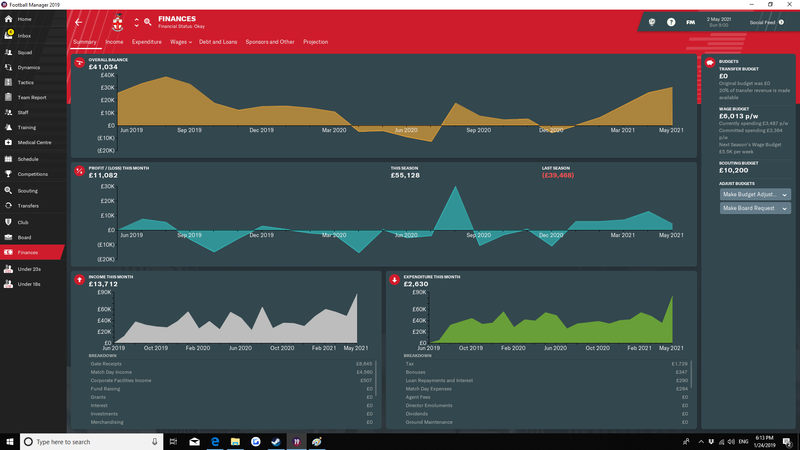 We are nearly half a million in debt, and despite saving money by signing players onto non-contracts, we are still losing a considerable amount of money. Hopefully promotion will lead to increased numbers through the gate and more favourable cup draws to bring in more money. 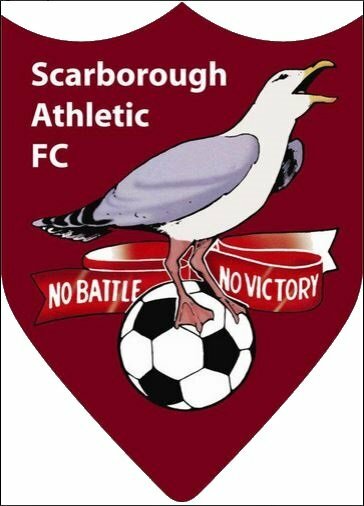 Plans for the new stadium were also cancelled, which was disappointing; we play over an hour away from Scarborough itself in Goole, which is obviously affecting our attendances. I'm very wary of potential administration, which would be catastrophic for the save, so fingers crossed the finances improve sooner rather than later. 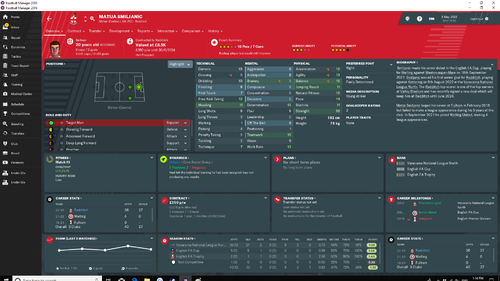 Youth Intake - Again not much to shout about here. I think maybe only 2 or 3 players here will be kept on. 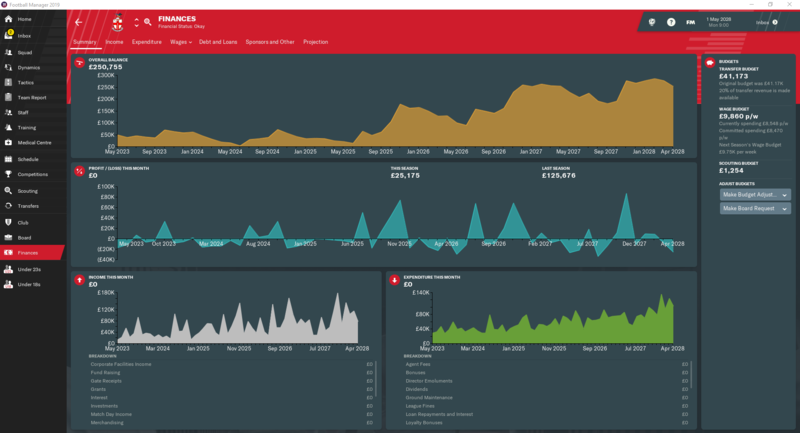 Finances/Transfers - Nice to see a healthly bank balance. Very successful transfer window with everyone contributing to the first team. 2020/21 Vanarama National 19th 4QF 3rd Round Survived relegation. I'm really excellent at finishing 20th. Anyone have a Leatherhead save? Insane season, really strong towards the end despite an injury crisis, qualified for the champions league next year, finished 4th! Really need to buy some players and have a bigger squad though. 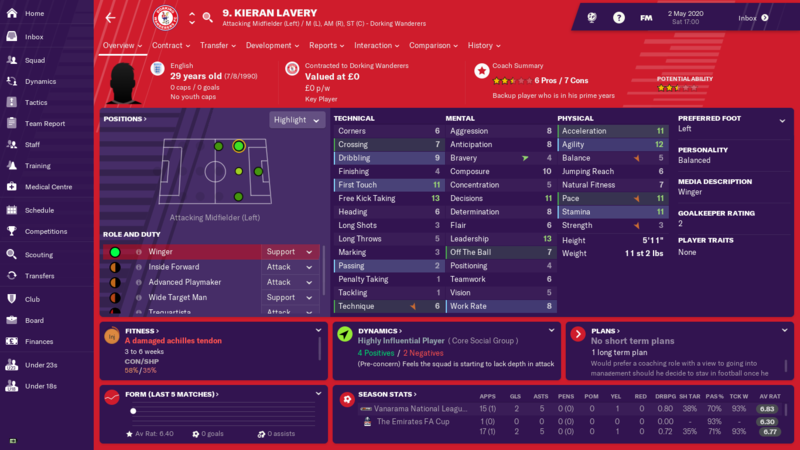 Youth intake - Nothing. Released them all. No one worth keeping. 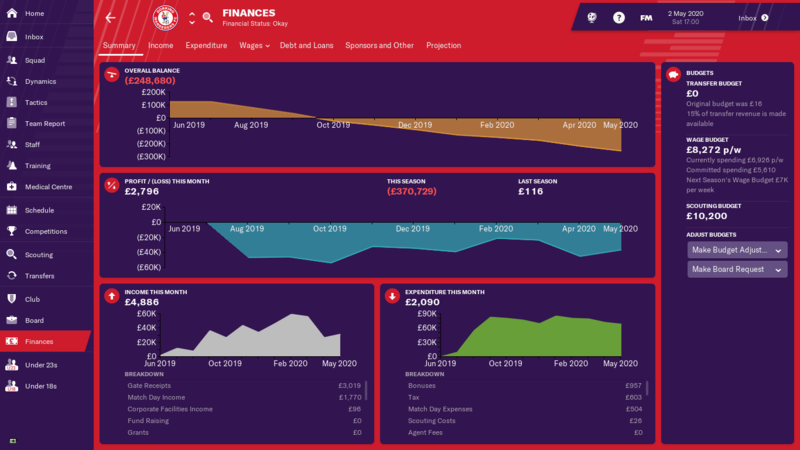 Finances/Transfers - Still positive bank balance. 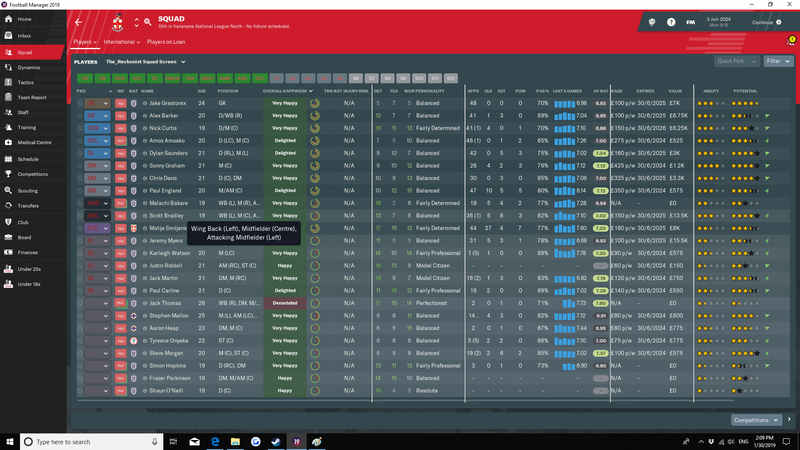 The good thing about this save so far. After four straight promotions as champions, we had made our way to the big league. The squad was going to need improving as this step up was far bigger than any other. League Table - we spent the entire season just below the big clubs (and Boro) and despite a poor finish to the season, we held on to 8th place. Carabao Cup - we played one game and it didn't go well! FA Cup - we came up short against a much stronger team. Squad - we have a number of decent players, but the squad lacks quality in too many positions for us to challenge the big clubs. 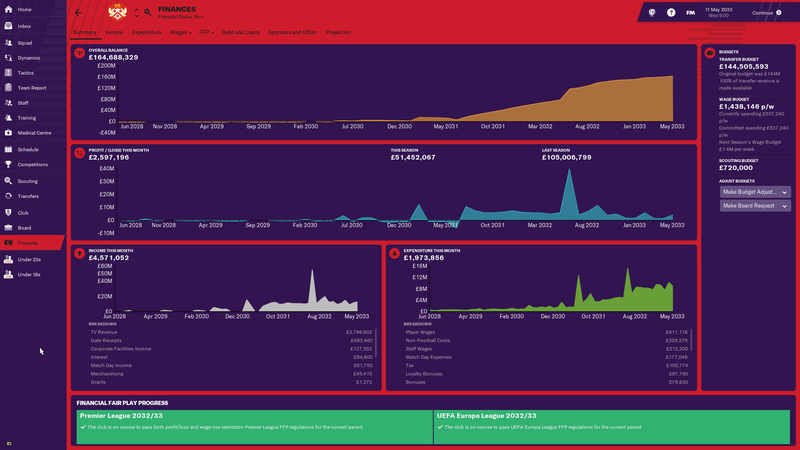 Transfers - it felt like I was splashing the cash, but £17.25m is nothing in this league. 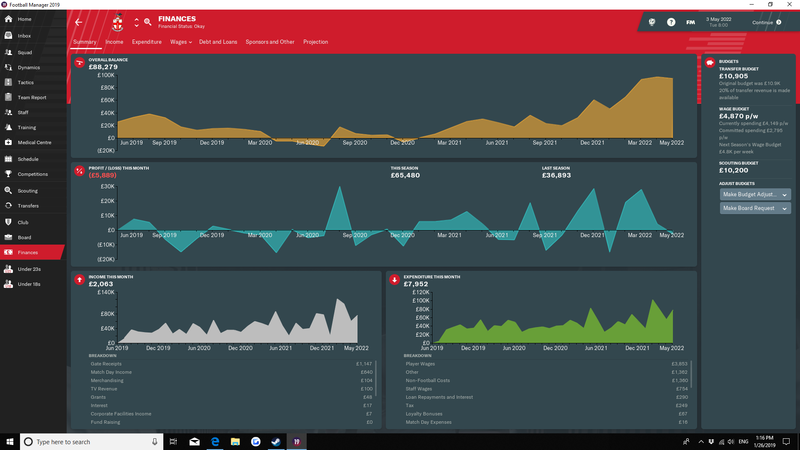 Finances - a combination of a borrowed ground, small contracts and limited spending helped us make a huge profit. 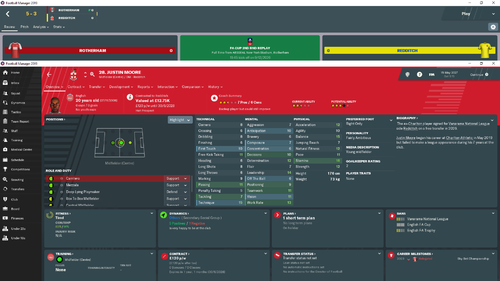 Florian John - the new striker made an immediate impact. 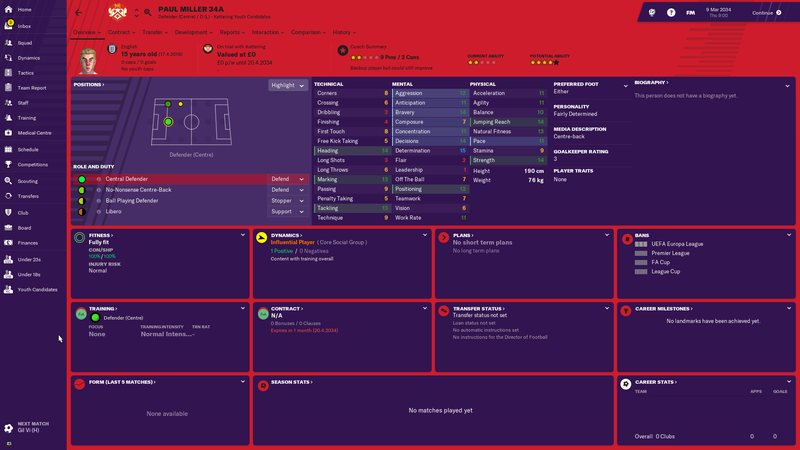 Dalibor Urbanc - a bargain at £200k. Adrían - not sure why, but he's our most valuable player. 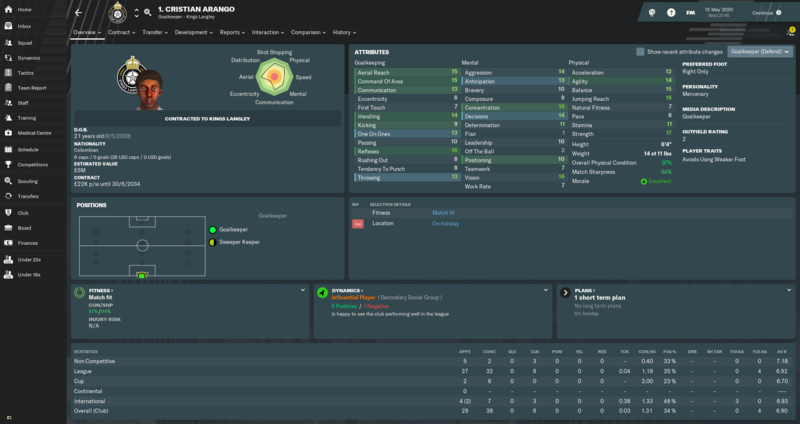 Cristian Arango - it felt wrong replacing our keeper, but my first wonderkid cost just £600k. 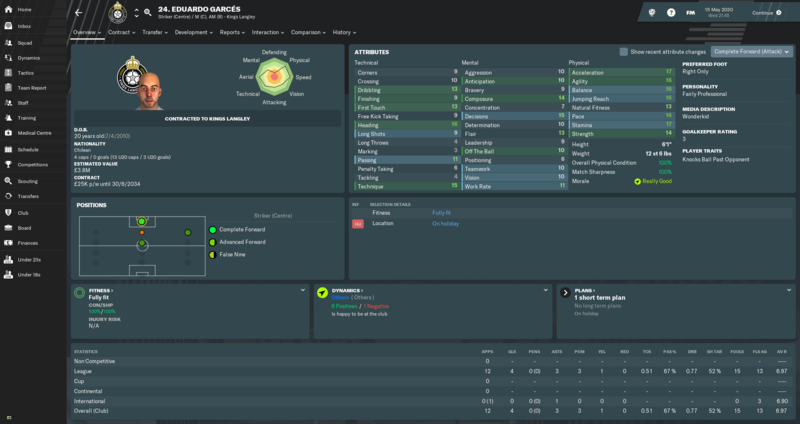 Eduardo Garcés - a January signing, hopefully he will be key next season. It was great borrowing Selhurst Park for a year, but we are about to move into our own new stadium which is half the size. The finances may take a hit, but we have plenty of money to spend. After finishing just off the European spots last season the goal were set. Survival, of course! 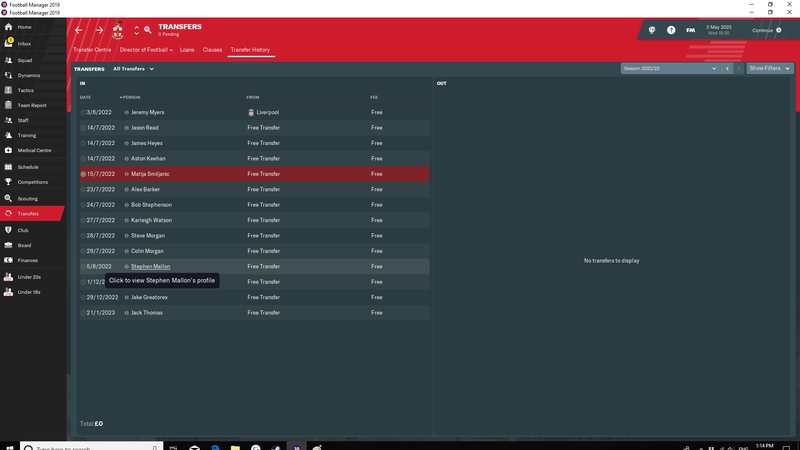 I don't have any other ambitions for this team for the time being. We have a lot of talented players, but there is quite the big gap between the best and the rest. And we really struggle when the best ones are injured or tired or out of form. We didn't sell anyone this summer, and we actually had a lot fewer offers this season around. I don't know if that is encouraging or not, but I'm happy to keep the players at any rate. When the season started we did pretty well, though we have to fight for all points we pick up. 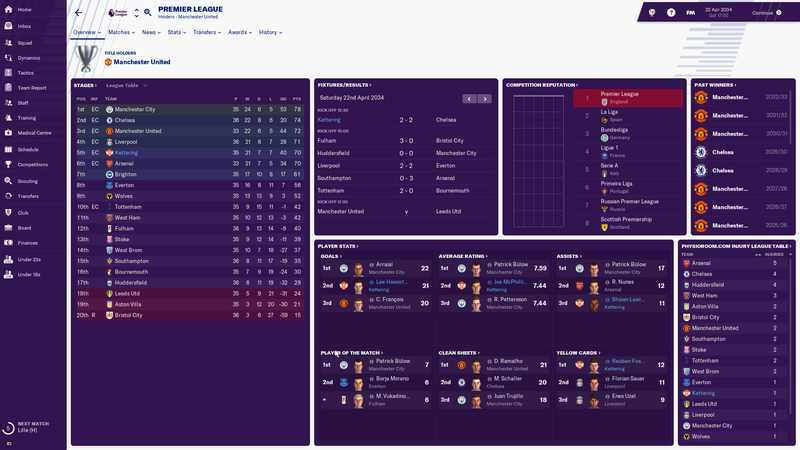 We did have some great results along the way though, back to back wins over Man Utd and Chelsea, but we also had some horrible results like losing to Blackburn at home. With so many young players still it's unavoidable that they swing up and down in form. Going into the final part of the season we were part of the fight for the Champions League spots. Manchester United and Arsenal had run a bit away from the pack, but we were part of the next group along Manchester City, Liverpool, Chelsea and Tottenham. Yeah, it's the normal bunch at the top. Everton, Southampton and Aston Villa were a bit off us, but they kept biting at our heels with every loss. In the end we finished in a very good 7th place qualifying for the Europa League next season. We were only 2 points off 3rd place though, so with a bit more luck we could have gotten into the CL spots. In the FA Cup we lost away to Championship side MK Dons in the 3rd round. 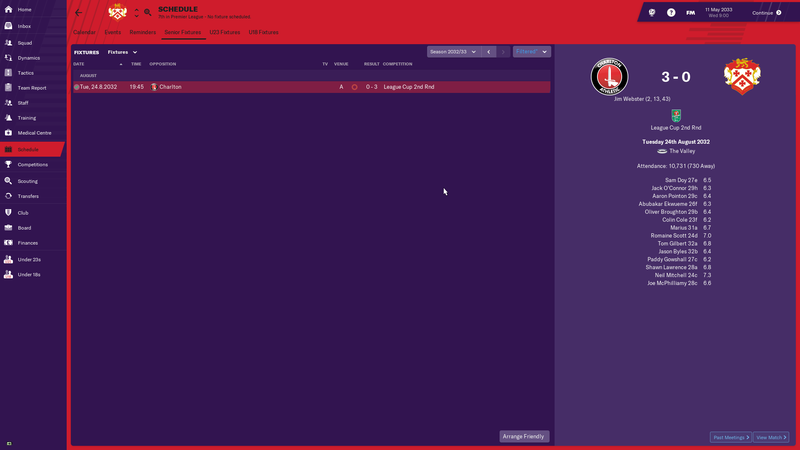 In the League cup we lost away to Charlton in the 2nd round. Not a good season for us in the cups this year. A decent youth intake this season. The best seems to be Luke Bird 33a. My son keeps being a part of the main squad and I try to give him as much time as I can afford. He is developing pretty well and are playing quite a bit for the Norway U21s. 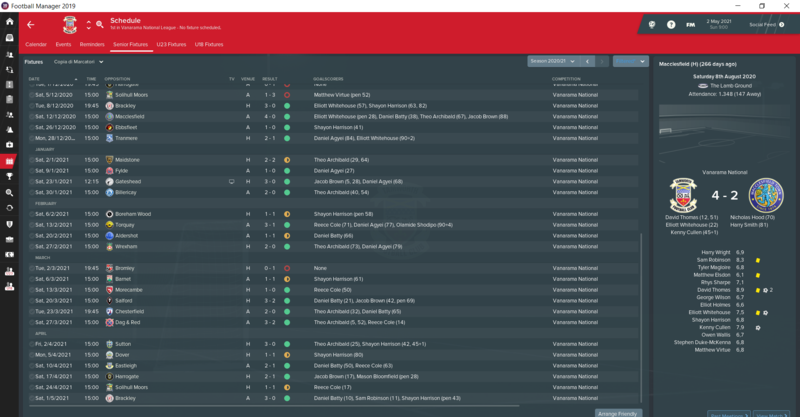 League Table - Finding it really hard to get consistency. A mid table finish. Certainly beat the board expectations of survival. 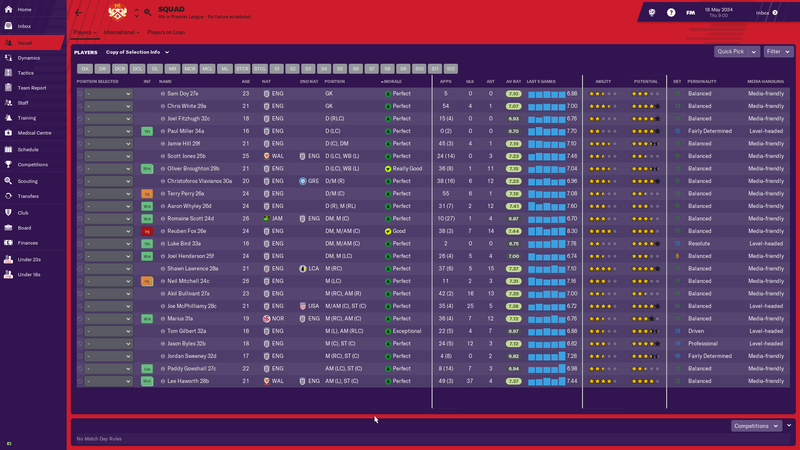 Hopefully we can push on for a playoff space next year.Smiljanic was the one standout this year. Frightening to think where we would be without his goals. 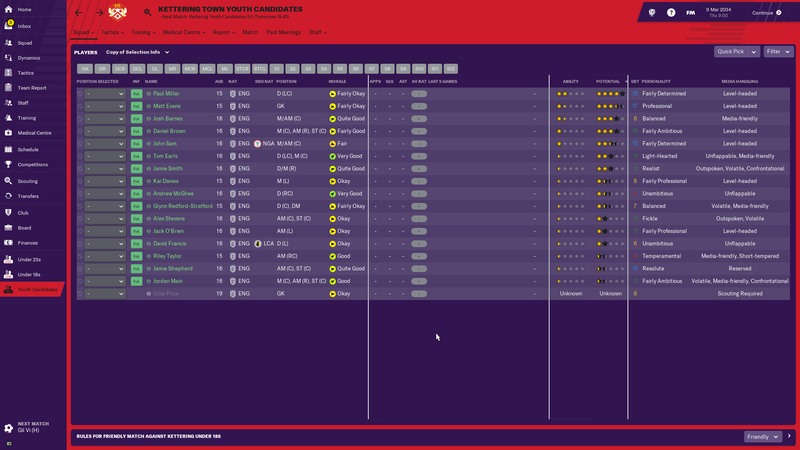 Youth Intake - Nothing. Cut everyone. Did get an upgrade in JC and YR though. 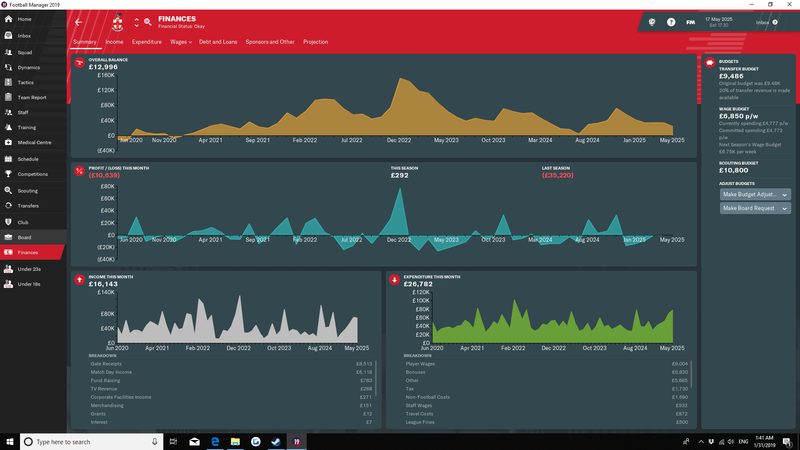 Finances/Transfers - Breaking even year on year. If we have an early exit in any cups it spells trouble though. League Table - A mid table finish and definite improvement from the previous year. 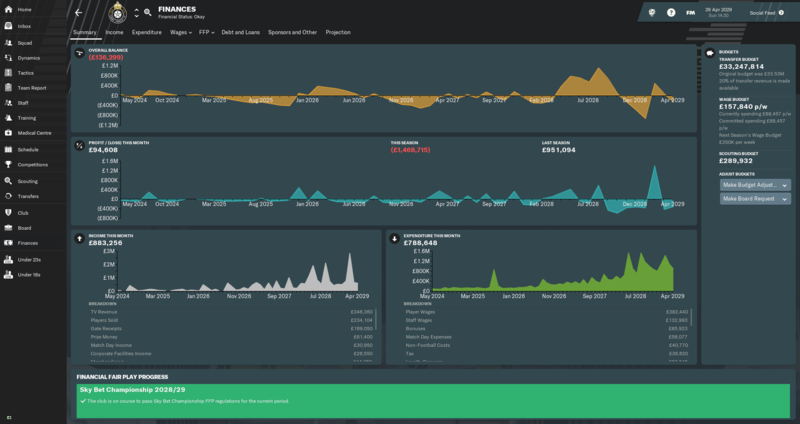 Finances/Transfers - Still in the black. No star players of note from the transfers. 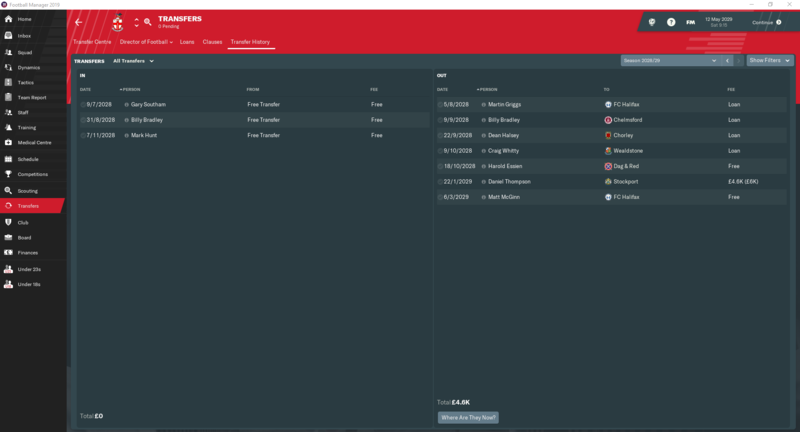 Transfers 1 & 2 Again I signed too many free agents. From the squad of the first season, only Sharpe kept his place in the starting XI. League Table - A great season.We managed to get into the playoffs and the stars aligned in such a way that history had to repeat itself. 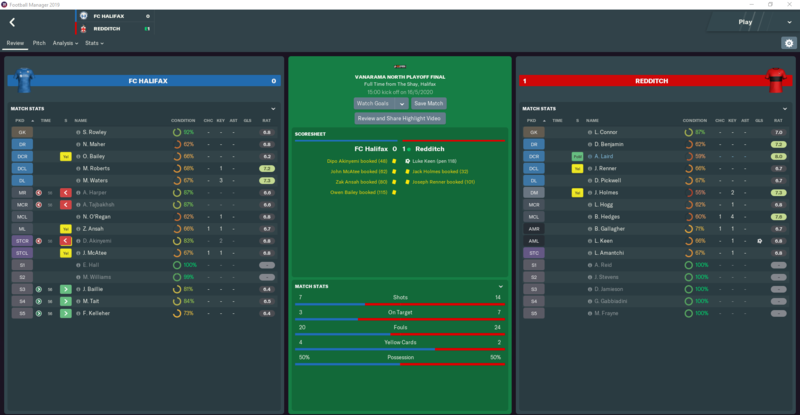 We won 3 tough away games on the bounce in the playoffs to secure a return to the National League! 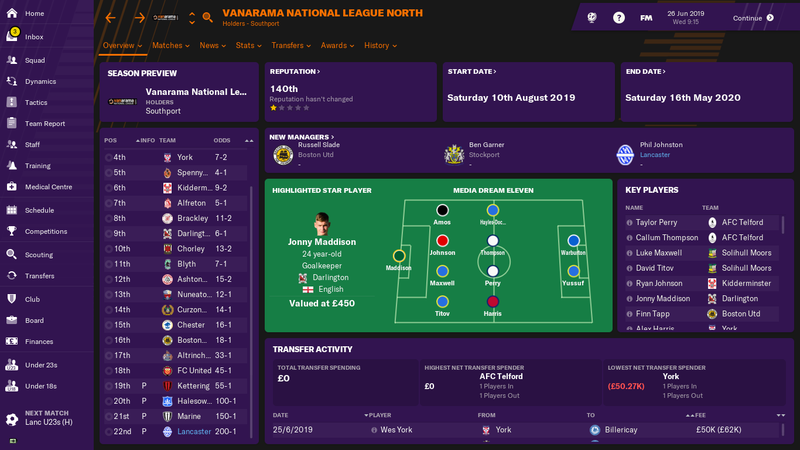 2024/25 Vanarama North 6th 4QF 3QF Promoted via playoffs. League Table - That was an absolute dogfight at the bottom , probably a record amount of points required for survival. We made it though! 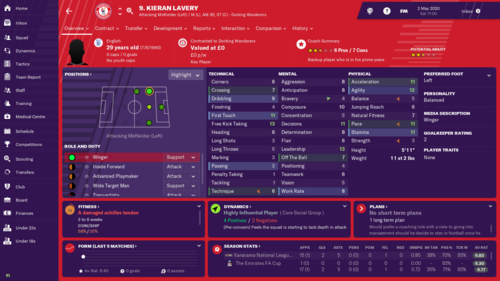 No Youth intake of note. 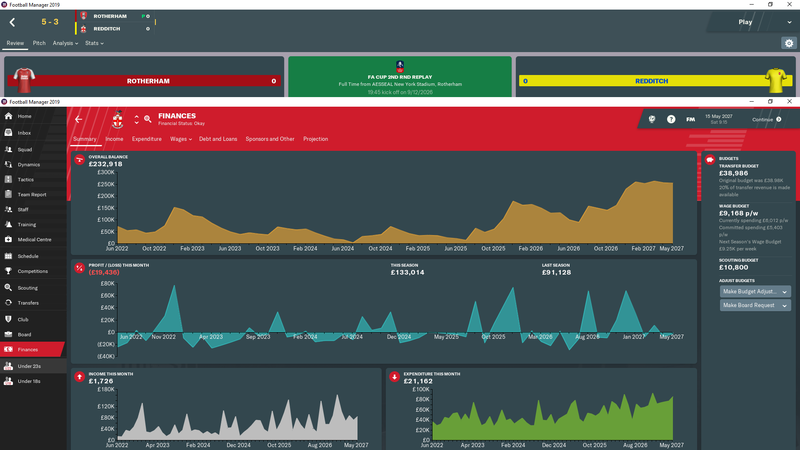 Finances/Transfers - Finances are still healthy. Signed 2 young centrebacks who were key to our survival in Jones and Griffin. We've had some very good seasons the last few years, and I just can't wait to see when it will stop. At least it didn't this season! However, before the season started I had a bit of a clearance sale were I got rid of quite a lot of players who had been with us for a long time, but were not good enough to be used in the Premier League. I got money for some of them, others I let go on a free, but I slimmed down the squad quite a bit. 10 players were sold or released during the summer, most had played quite a lot of games of games for the first team. 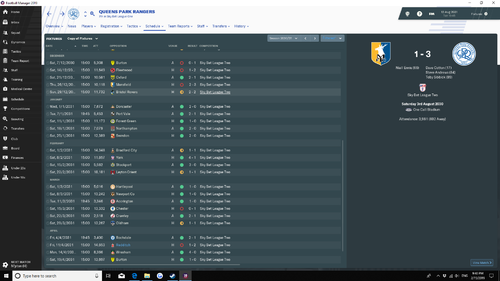 Even thought we lost the season opener to Brighton we had a great start and didn't lose another league game until December, so we established us firmly into the fight to the top spots. It were clear it was a 6 team race after a while, the same old big teams, but with one exception. We had taken the spot of Tottenham who struggled in the relegation zone for a large part of the season before having a strong spring to get back into the top half. Toward the end of the season Manchester City had run a bit away with the title, but the battle for the Champions League spots were on. With a few matches left everyone in the top had a fair shot. Going into the final match we had a chance, but were reliant on Manchester United losing away to Wolves while we won away to Bournemouth. We did our job, and I were delighted when I saw Wolved had scored a late winner! This caused us to get the 4th spot on more scored goals! Even points and even goal difference! 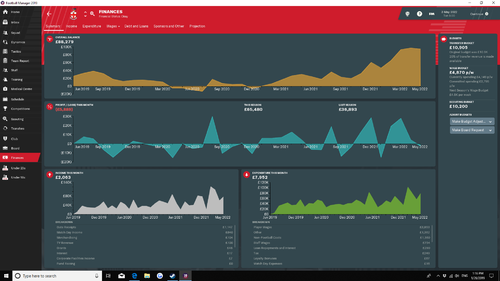 And it makes it clear what we need to work on in the coming seasons, we are conceding a lot of goals, but on the flip side we are scoring a lot. Just how I enjoy my football. Champions League here we come. 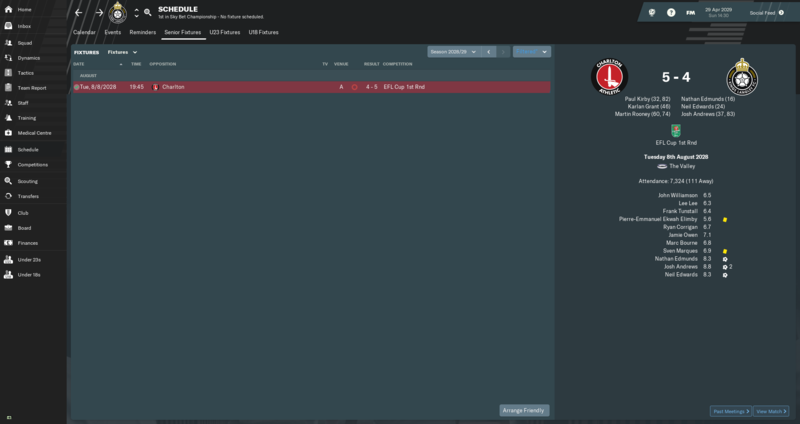 We also had our first try in Europe this season and went straight into the group stage of the Europa League. Our group contained Feyenoord of Holland, Schalke of Germany and Zorya of Ukraine along ourselves. We won both against Zorya and Feyenoord, but lost away to Schalke and drew at home and qualified a the runner up in the group. In the first knockout round we drew Atletico Madrid of Spain, a very tough opponent. 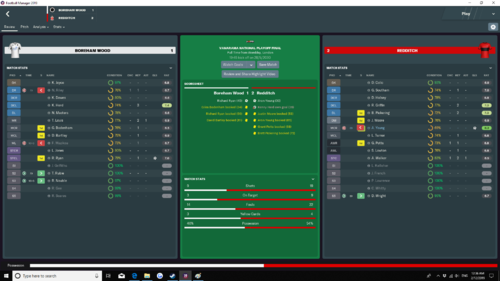 Somehow we smashed them 5-0 at home, and followed it up with a 3-1 win in Madrid. In the 2nd knockout round we got Gil Vicente of Portugal. 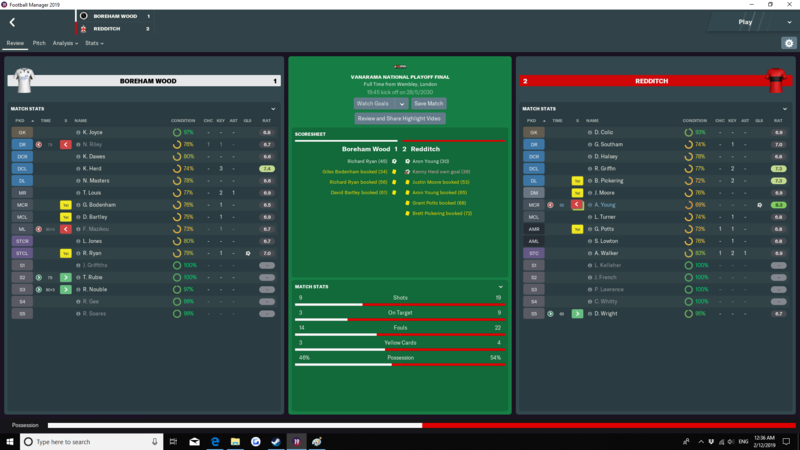 A fairly easy draw as we beat them comfortably 10-1 on aggregate. In the quarter final we faced Juventus of Italy, one of the best teams left in the competition. In Turin we countered them down and won 3-1, and then did the same at home in a 2-1 win to get to the semi final. Here we once again had an easier draw and beat Lille of France without much issue. 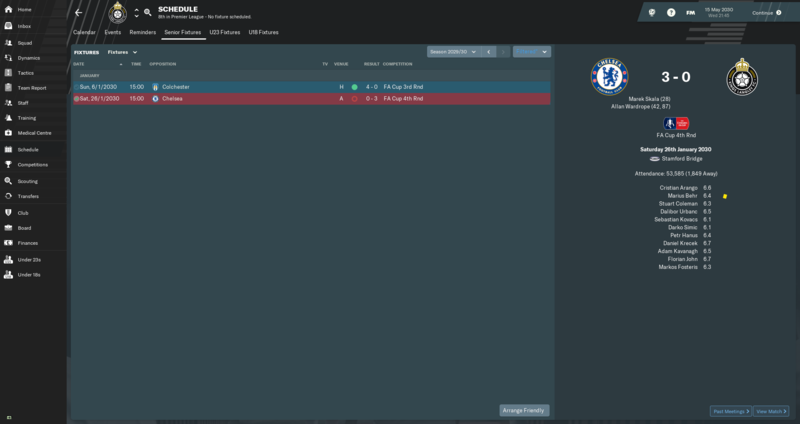 In the final, hosted by Belgrade, Serbia we had a shot at a rematch with Schalke. 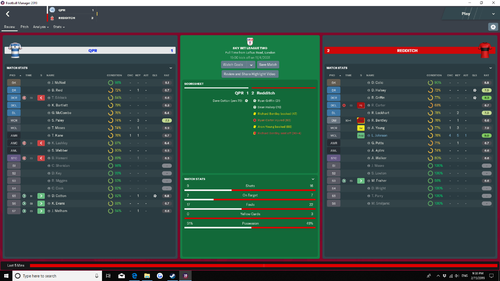 We had a horrible start though as we conceded after just 3 minutes, and almost before the replays of the goal were done we gave away a penalty and conceded another one. 0-2 down after only 4 minutes is not the way to start a final. At the half hour mark they scored a third, and we were lucky we didn't concede another one just before half time. At the break we did some changes, since things were clearly not working. We pulled 2 back with 20 minutes to go, but we just didn't find the equalizer and lost the match 2-3. Runner up is a tough finish, but still a great first campaign in Europe for us. I did something dumb though. 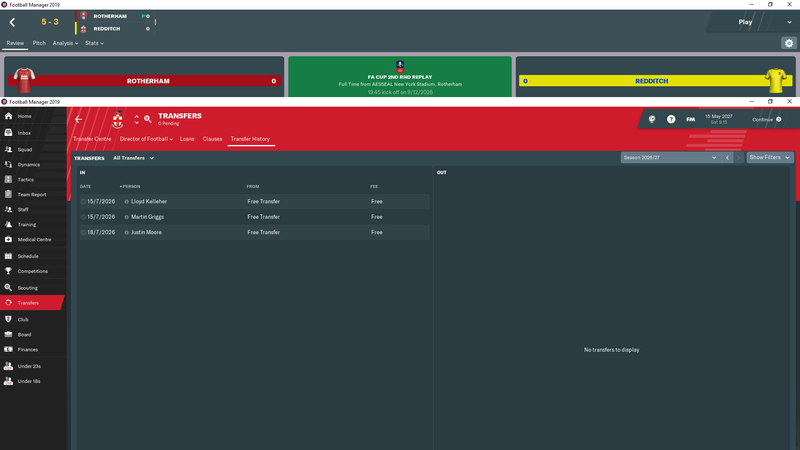 I cancelled a link with a non-league team we had been linked with for a long time, and then I found out we had borrowed their training facilites, so ours are now much poorer, but we are improving them though. 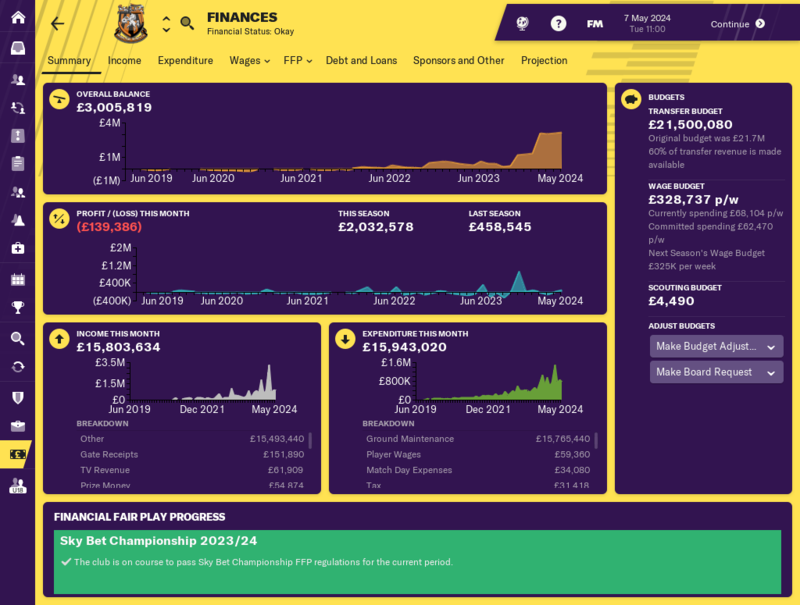 Our finances are amazing since I'm not using it to buy players. Our new stadium should be done by the end of next season, so we are playing at King Power Stadium for another season. In the FA Cup we beat Ipswich before losing to Derby after extra time in the replay. 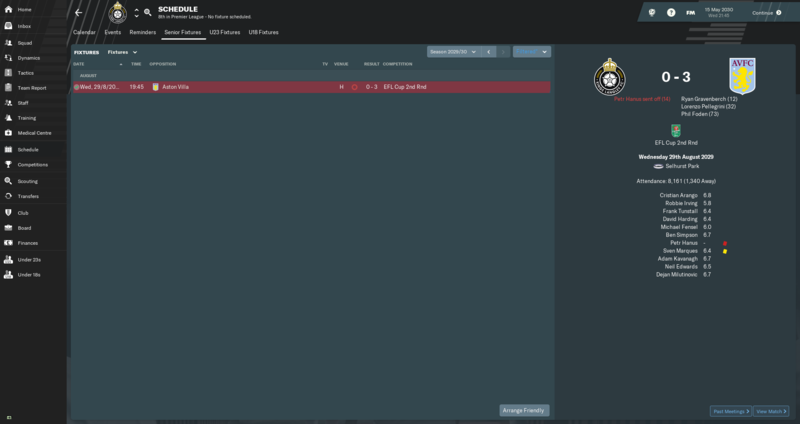 In the League cup we beat Oxford, but got thumped 0-4 away to Tottenham. We had a pretty good youth intake this season. The most promising is Paul Miller 34a. My son had a very good season where he both scored a bit and assisted a lot. He is a regular at the Norwegian U21s and have been looked at by the Norway manager a couple of times, so he might get his first call-up soon. League Table - A successful season which im quite surprised to finish on top, thought the jump up to the EFL would have been a difficult task and a mid table finish was my expectation which was also aligned by media pundits predicting my to finish 17th. 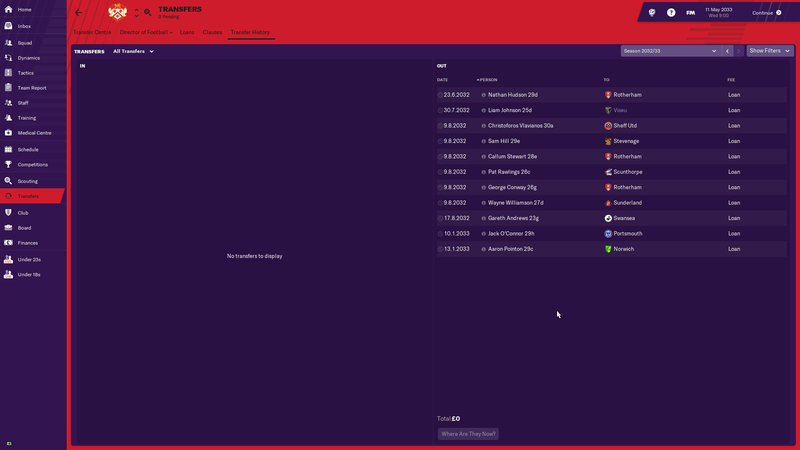 Always get a sense of where my team is at towards the end of the transfer period when players request a promise of gaining promotion which was becoming a common theme. With a wage budget of 18k per week (the snapshot of finances shows next season after promotion to 40k) it was going to be hard to fit under budget so was able to utilise quite a few good 3.5 current ability star players for free from higher divisions. Finished the season with 7 loanees including 2 that were on the books last season that were sold for profit. Managed to get the second highest points tally in L2 since the start of my save but didn’t ever feel that way, but on the other hand didn’t really feel like I wasn’t going to get promoted either. Team around us kept tripping over when we’d have a blip. What I learnt was my first 11 was very strong with a couple of good subs on offer, but the depth just wasn’t there and if I had to rest or players were injured id struggle to put in a good display. With quite strict wage structure this is probably not surprising. 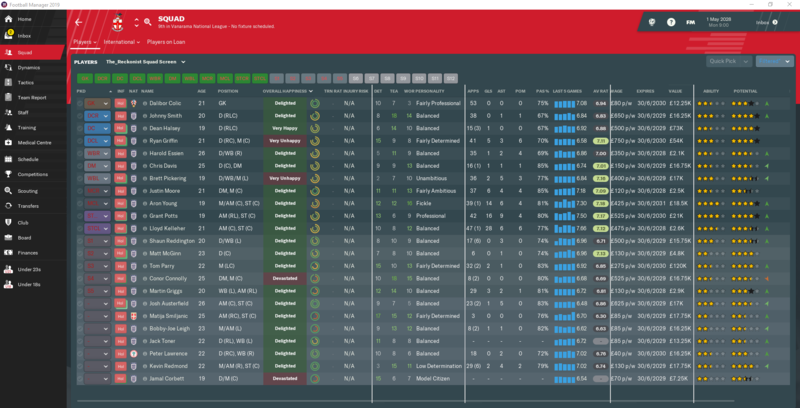 This leads me to my very disappointing FA cup performance in the first offering. Up against Exeter who finished 15th in the same league, was destroyed 3 – 1. 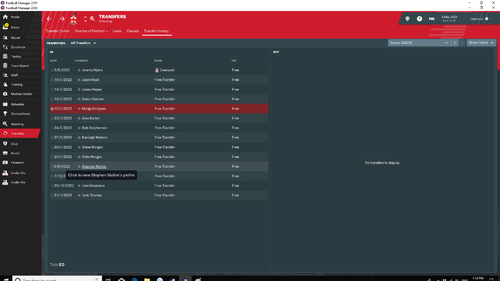 Have not progressed further than the 2nd round (by which Exeter knocked me out in 2020). I will put more effort in this next season! In the Carabao cup I was placed against Fleetwook away in the 1st round who are in L1. Ended up beating them on pens and got an away tie against Birmingham who were last in the championship and was totally dominated 4 – 1. Got 50k out of it in gate money at least. Finances were on the decline again, finding it extremely difficult to make a profit despite being diligent with wages. 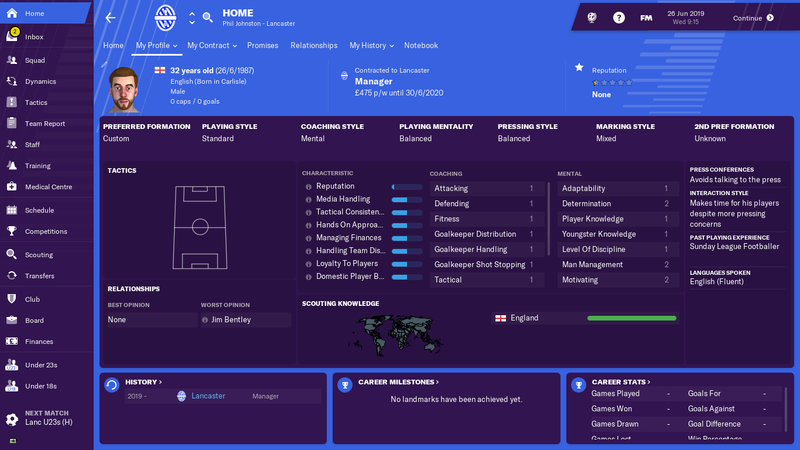 Managed to sell my back up keeper Jon Andrews who was my first choice last season to Milwall for 275k plus 50k add ons and a 50% sell on clause which helped us keep afloat. Managed to also sell a back up attacked for 35k which I was pleased with. 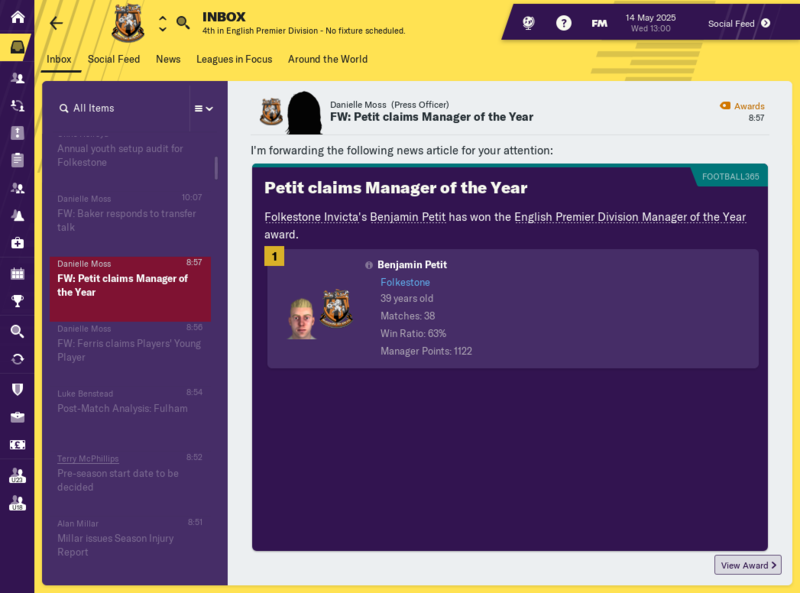 Also got 36k as my assistant manager was poached mid way through the season. 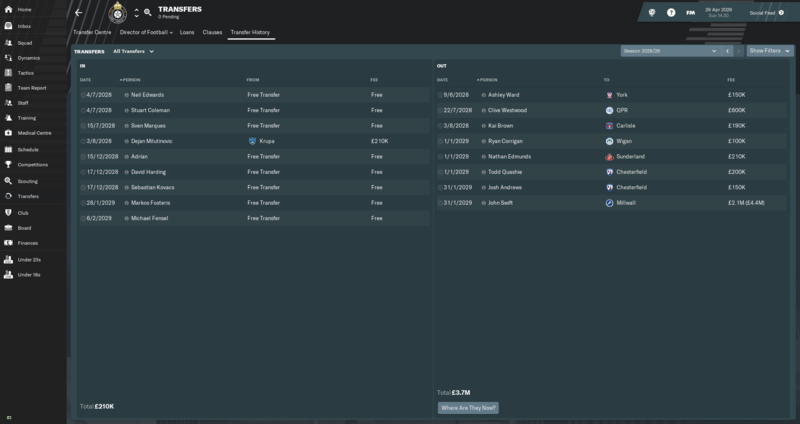 Will be an overhaul of the squad for L1 with 7 players returning to their parent club, no doubt will be looking to exploit the loan market again next season and hopefully poach some good young talent from the premier league teams for free. 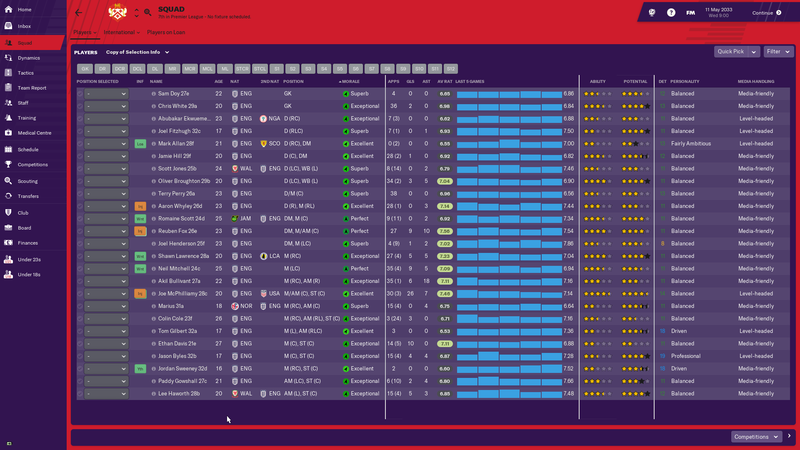 Expectation will be mid table, but if I can attract the right talent, will be pushing for my third promotion in a row. posted my finances too early, got a lovely solidarity payment a little after my screenshot of 500k thank you very much! 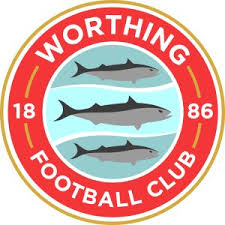 Playoffs - We sadly could not repeat any playoff miracles and lost to a solid if unspectacular Eastleigh side. Cups - Really unlucky against Rotherham and should have won but lost on penalties. League Table - Solid season , disappointing to miss out on the playoffs. Cups - Decent Cup runs , making slight progress every year. After the success last season, I wanted to build on it and try to keep improving. We slowly are building up our facilities, and that is our worst hindrance at the moment. I let a couple of player leave because their contracts were at an end, and only sold a single player this summer. When I look at my current squad I see a quite good squad without any major holes in it, and that's reassuring, but at the same time, I'm not quite sure what positions I would rather come through the next few youth intakes. Continually improving the facilities are the way to move forward at any rate, so that is the focus. 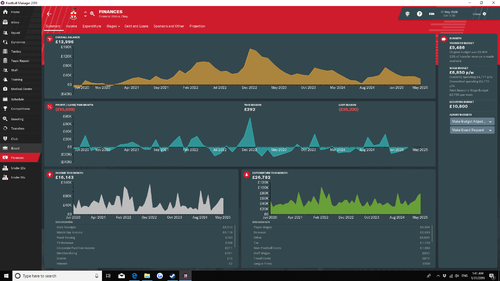 The season it self started pretty good, albeit losses to Man Utd and Chelsea early on put us on the back foot compared to the other top teams. We did continue to play well for the most of the season, but we never really shined and thumped teams. The defense still need work as we are conceding a lot of easy goals, but hopefully we can avoid a couple of them when our 22 and 19 year old first choices in the central defense get a few more years of experience. We only really hit a slump in form towards the end of the season were we only won 1 of the last 6 league matches and almost lost out on a very safe 3rd spot. 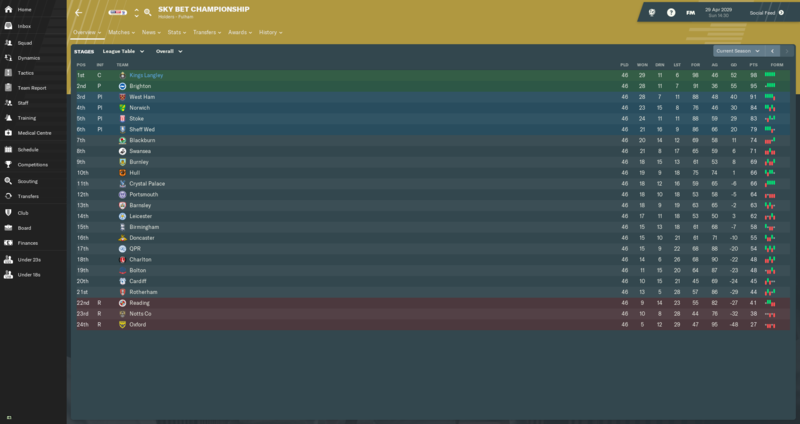 With 8 matches left we had a good chance of a title in competition with Man Utd and Arsenal, but the poor results at the end allowed them to leave us behind. Still, a 3rd place is very good, and allows us to enter the Champions League again next season. In the FA Cup we embarrassingly lost to League Two outfit Yeovil in the 3rd round. However, in the League cup we beat Preston, Man Utd, West Ham and Liverpool before thumping Chelsea 3-0 in the final to clinch the trophy. Oh, and our U23s won the League Trophy. This season also marked our first attempt in the Champions League. We were qualified straight into the group stage were we drew Villarreal of Spain, Paris SG of France and Inter of Italy. We did good and finished in 2nd place behind PSG, but ahead of Inter to go through. In the 1st knockout round we drew Sporting Lisbon of Portugal. After a poor 2-2 result at home we beat them 3-0 away. Our old nemesis Schalke of Germany were our opponent in the quarter final. After the Europa League final loss last year we got our revenge when we knocked them out to go through. In the semi final, we drew fellow Englishmen Arsenal. A 2-3 loss at the Emirates were not bad, but when we attacked them at home, they countered us blind and scored 6 goals in the first half! We actually deserved to win this match, but very unlucky. The press even asked about our luck were they confirmed we had hit the woodwork 5(!) times. So out in the semi final is tough, but it's still a great run from us. 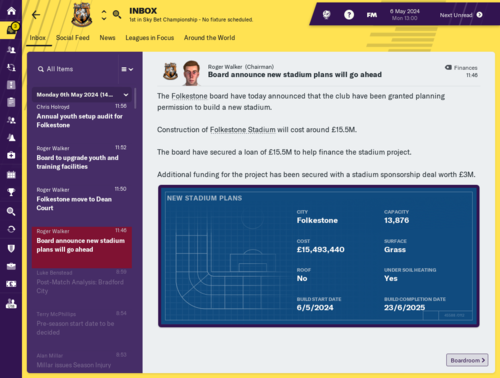 During the season I got a message that our stadium plans had been scrapped and a new one were confirmed. 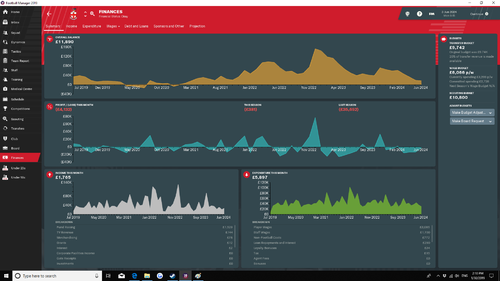 No more 14k, now we are looking to build a 49k one instead! They started to build it during the season and the plan is to have it done by the end of next season, so we'll see. I also got more improved to facilities approved, so they will be done during the next season. 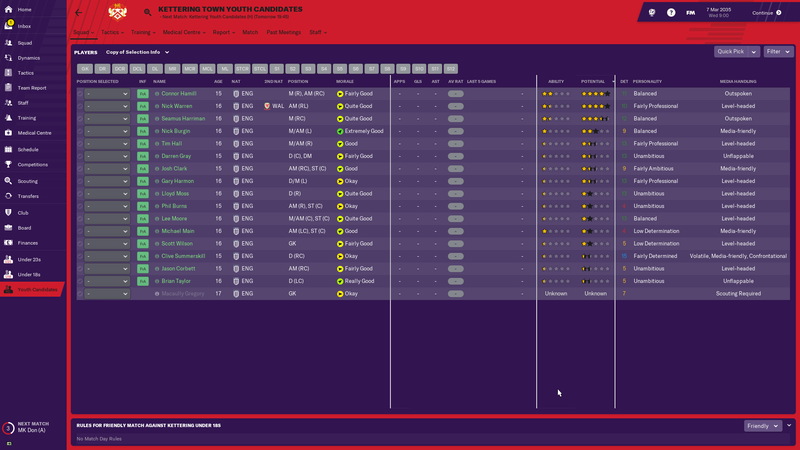 We had a good youth intake this season and the one who stands out is Nick Warren 35b. 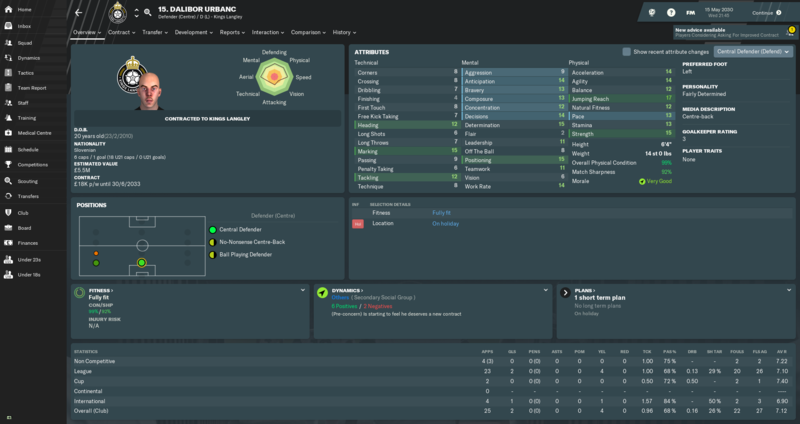 My son had another good season and have established himself as good played in the squad. 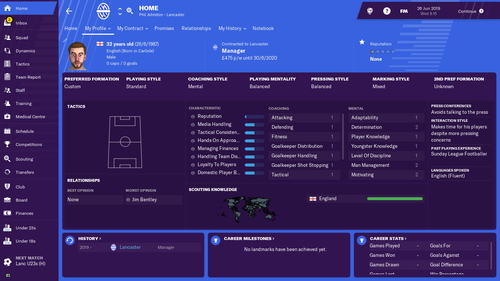 However, he have started to play for England U21s instead of Norway U21s. At the moment it's unclear where he ends up, but exciting none the less. League Table - We were dreadful for a large spell of that season. How we managed to finish in the top half who knows. The defence is actually rank rotten and I will be specially looking to sign players in the summer there. Cups- Again decent , pulling off a minor upset against Swindon. 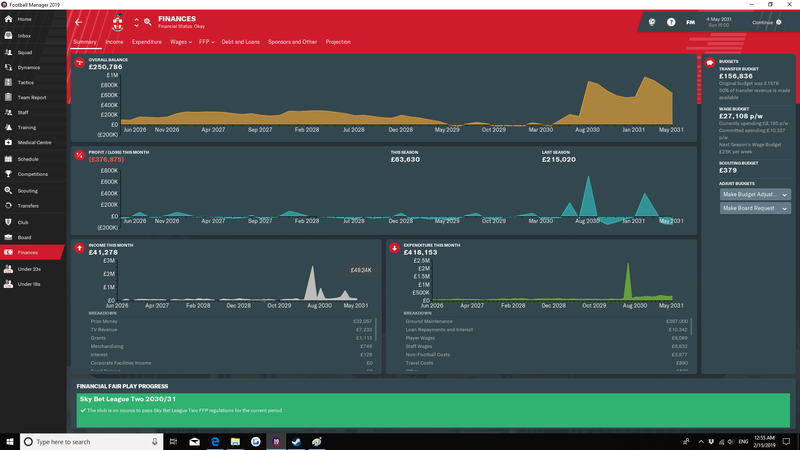 Finances/Transfers - Made a loss this year. I signed some players for bigger wages but will need to trim then down now. The Seadogs will not want to dwell for long on what was a hard season but, thanks to some performances that surprised many people, they were at least able to avoid automatic relegation." A very difficult season where we survived by the skin of our teeth, mostly due to some decent early season form, but helped by two incredible wins in our last four matches. After 16 matches, we were in 16th place and looking okay. 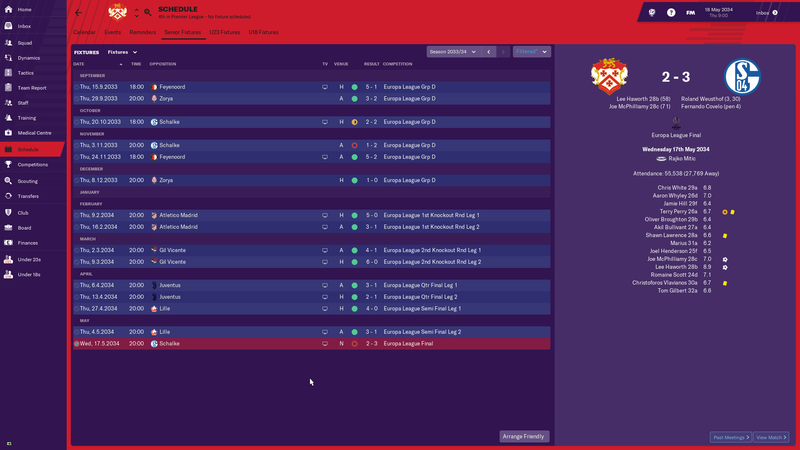 However, on matchday 17, were hammered 6-2 by Aldershot, and that started a very rapid and worrying decline; we didn't win a match from then until matchday 26, and by then we were in the relegation zone. 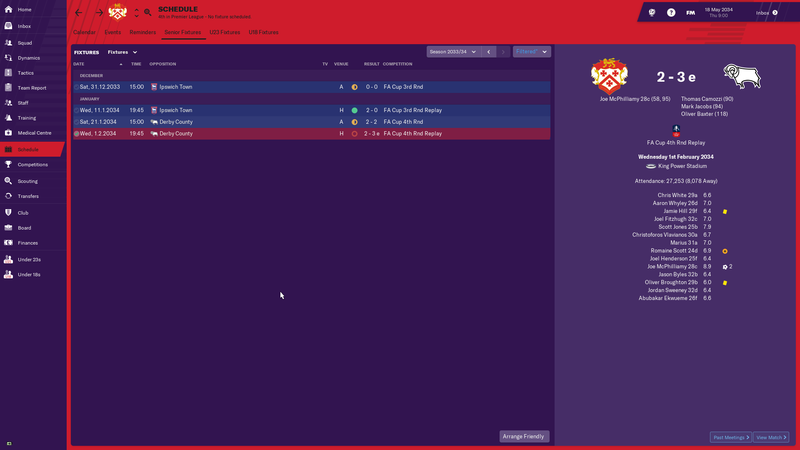 We finally beat Chelmsford 1-0 on matchday 27 to move up to 18th, but 3 defeats in a row saw us fall back into the relegation zone. 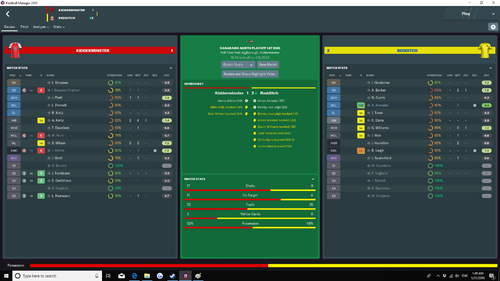 A 3-0 win away to Guisley saw us rise back up to 18th, and 2 draws against Wrexham and Macclesfield saw us pick up some much needed points. 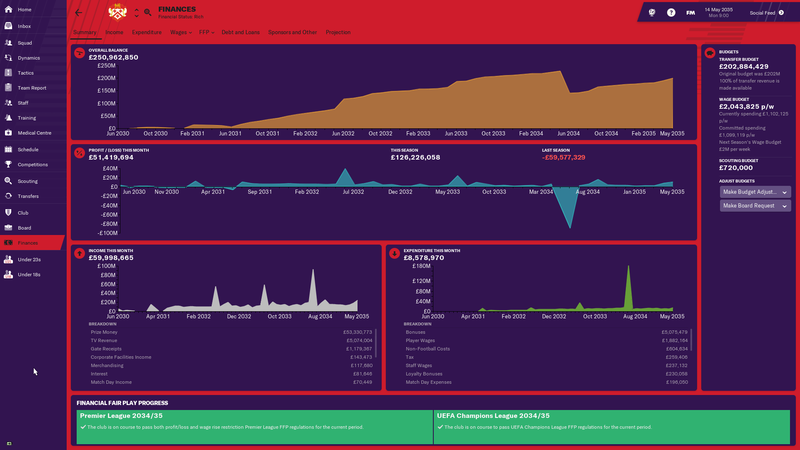 Unfortunately, yet more poor form followed and after matchday 41, we were sat in 22nd place. Matchday 42 saw us draw 1-1 with 10 man Torquay who were also battling relegation, and at this point, immediate relegation seemed inevitable, and this was really hammered home when I saw our last four fixtures; 3 away matches against the then top 6 (Gateshead, Hartlepool and Cheltenham) and home to mid table Solihull Moors. I should point out at this point that I had changed tactics to the one above and, while it had showed some promise, injuries and fatigue meant I was regularly unable to field my strongest XI. 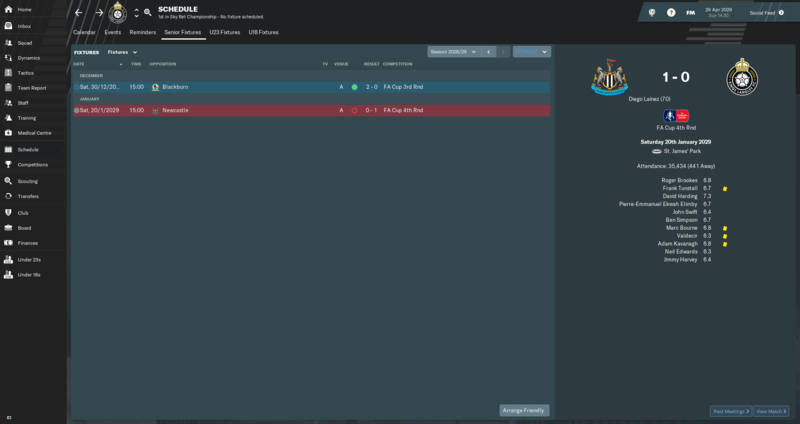 So, matchday 43 rolls around, and we make the journey up to 5th place Gateshead. I was expecting a defeat to add another nail into the coffin, but there was life in this old Seadog yet; with our strongest side out, we simply blew Gateshead away, and we were up 5-0 at half time, and eventually ran out astonishing 6-0 winners, moving us back up to 20th place, just outside the relegation zone ahead of Torquay who had lost the same day. Although we did lose 4-1 to Hartlepool in our next match, Torquay could only draw, leaving us a point ahead going into our last two matches. 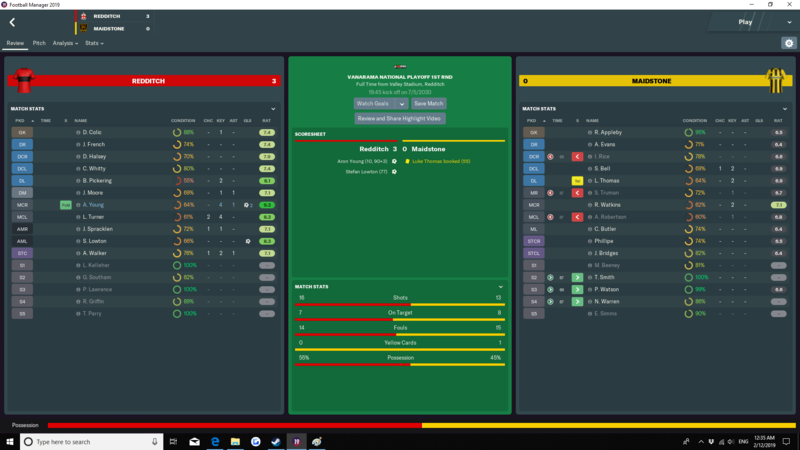 We proceeded to beat Solihull Moors 4-1 and the victory, coupled with Torquay's loss to Tranmere, saw us secure our survival. 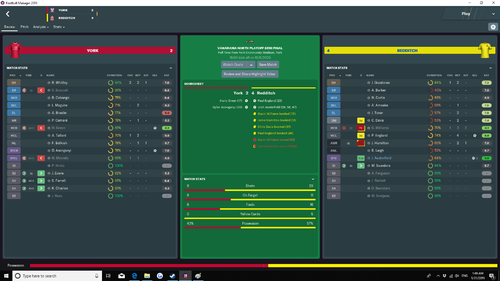 Our final match was away to 2nd placed Cheltenham, so I fully rotated the squad as we could finish no higher or lower; the fringe players put in a very admirable performance, only losing 4-3 with Cheltenham's winner coming in the last few minutes. Performances in the cups were poor this season. We fell at the first hurdle in both cups; in the FA Cup, we were knocked out in the 4th Qualifying Round, losing 4-0 away to Altincham in a replay after drawing 0-0 at home in a match were we couldn't hit a cow's arse with a frying pan. 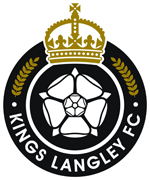 Similarly, we lost 3-0 away to Guisley in the 1st round of the FA Trophy after drawing 1-1 at home. 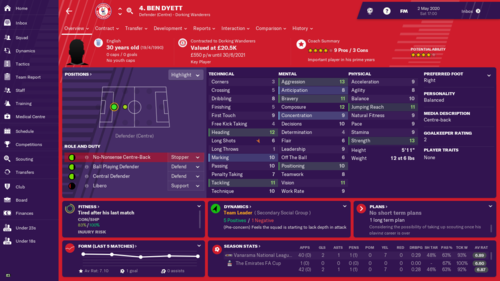 Not many players impressed this season as only two finished with an average rating above 7.00; Joao Rangel and Matty Dixon. Ashley Pope also deserves praise for finishing with a career high of 17 league goals, despite a finishing of 7. Shoutouts to both George Willis and Ben Adamson for reaching 200 league appearances each during the season. Aside from that, I don't think the rest of the squad really warrant in depth discussions. As for transfers, the two notable ones were the departures of Joe Noble, our best youth player to date, to Rotherham for a fee of €3k, with a 50% sell on clause, and Jaden Palmer-Leandre to Shamrock Rovers for €20k (on a personal level, it was nice to fleece them for that much money ). 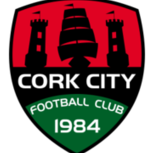 We also have friendlies arranged with the two of them as per the transfer negotiations, which will bring us in about €30k in gate receipts. League - I actually finished this season around Christmas time but apparently never posted my update so this will be brief. Finished in 5th but we were on a poor run going in. 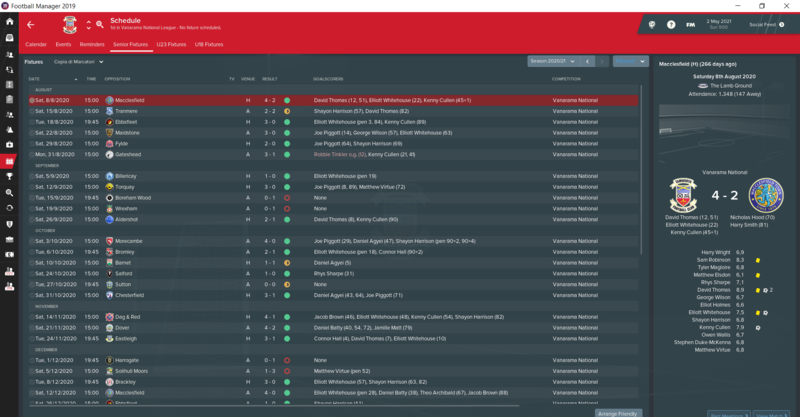 We lost in the first round of the playoffs which meant we were staying in League 2 for a third year. Cups - EFL and FA Cup both say us crashing out in our first games against Wigan and Sunderland respectively, shame on the FA cup once again. We did find success in the EFL Trophy which say us make it all the way to the Southern Quarter Final. Not a big money maker but the prize money for winning certainly helped balance our hemorrhaging money. 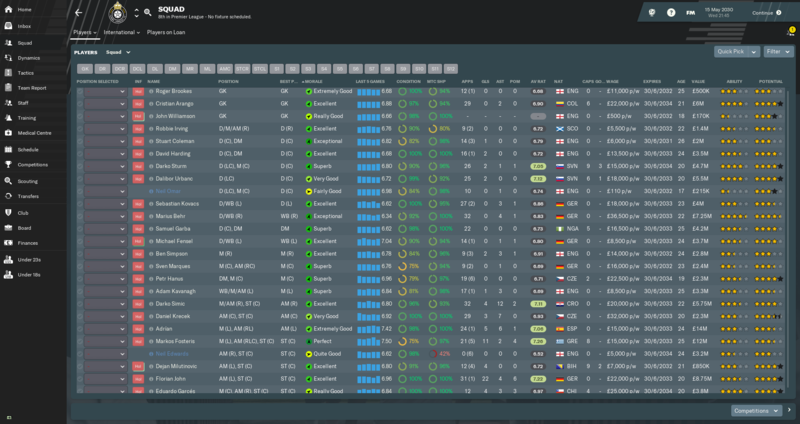 Transfers - Sold a player who was moaning about playing time, very pleased we got that amount for him. We got a new GK(Annerson), new starting striker(Williams) and two starts in a loan. Williams became the first player in club history to represent their country at a World Cup! League - What a season. Words cannot describe the range of emotions this year. 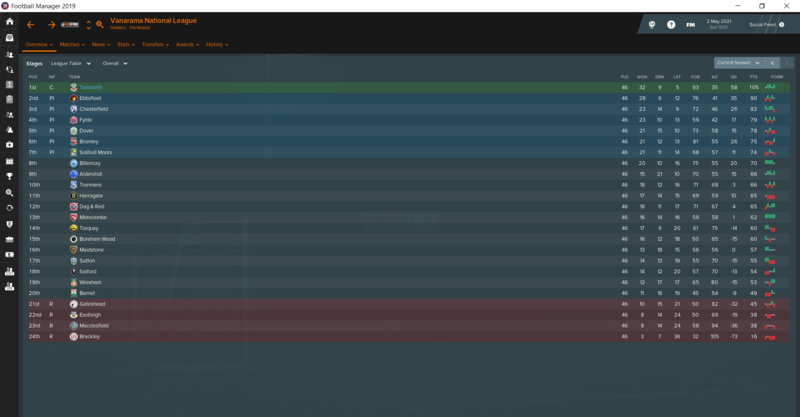 We were in a dogfight to avoid relegation after the first 23 games. We then turned on the heat and started blowing teams away. We were so close to winning the league! 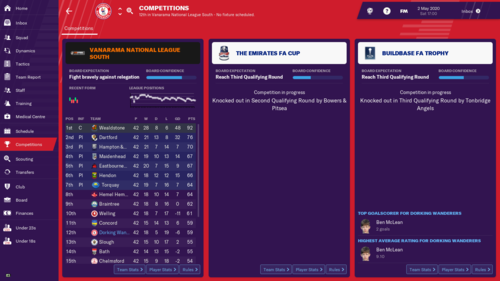 Playoffs - I don't think there was any doubt that Redditch were favourites for the playoffs promotion giving our recent form. 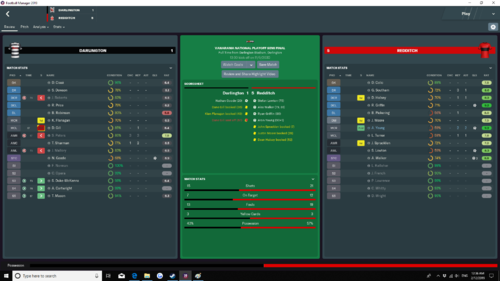 The Darlington game was ALOT harder than the scoreline suggests. Finances/Transfers - Another solid season here. Turner and Walker were catalysts for a great season. Young was also great. Youth - Finally something to write home about here. A decent bunch here. We turned full time now that we are in League 2! 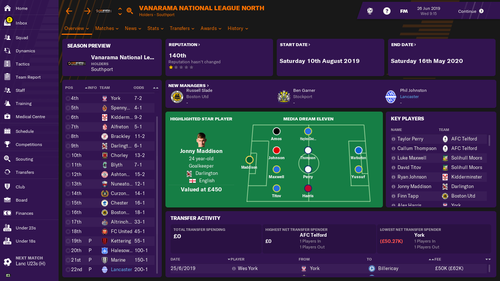 2029/30 Vanarama National 5th 3rd Round 1st Round Promoted via playoffs. Thought I start the challenge, managing Farsley. League Table - An utterly fantastic season where we demonstrated exactly what this club is capable of. I think this season culminated when we went away to a red-hot QPR side who had only lost 1 of their last 17 league games and played them off the park. Youth - Starting to build a youth squad but along way to go.